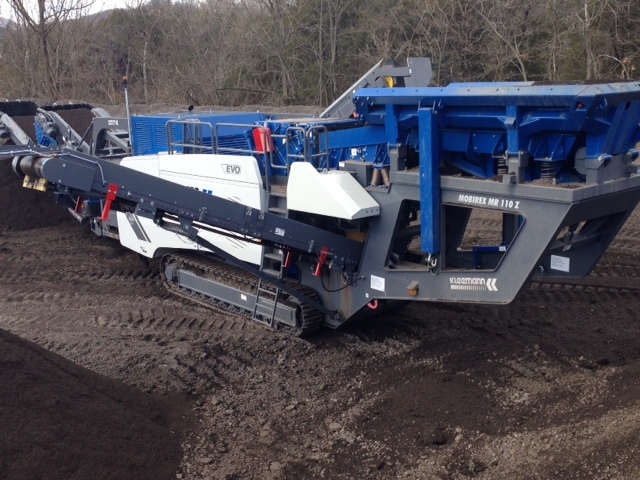 Gravel Pit 50 HP model 630H moves gravel at German lake dredging operation. 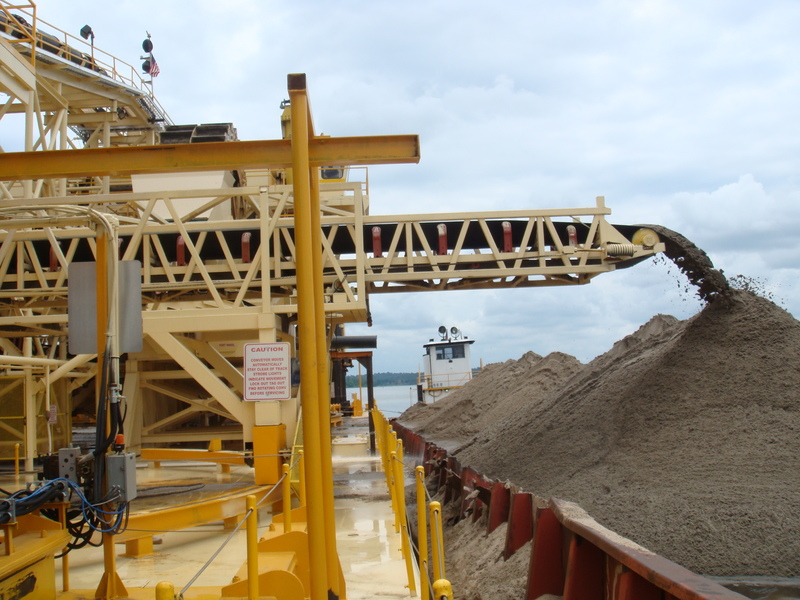 Gravel Dredge 15 HP model 400M transfers gravel to barge at US river dredging operation. 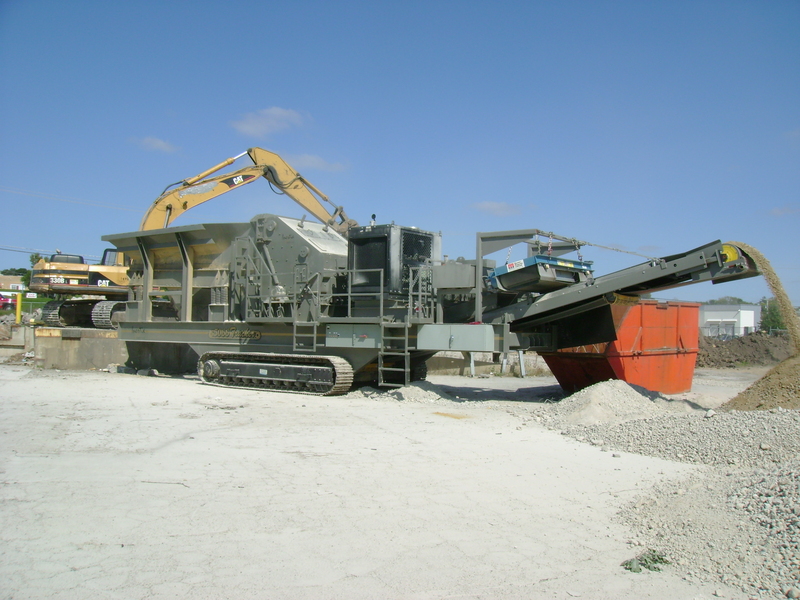 Concrete Plant 10 HP model 320M move sand and gravel at Spanish concrete plant. 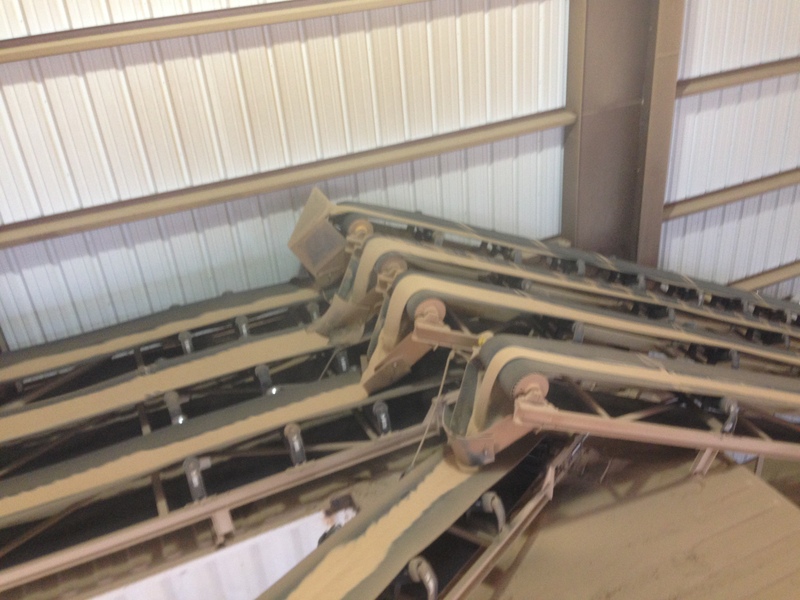 Frac Sand Plant 5.5 HP model 220M move dried sand at Texas frac sand plant. 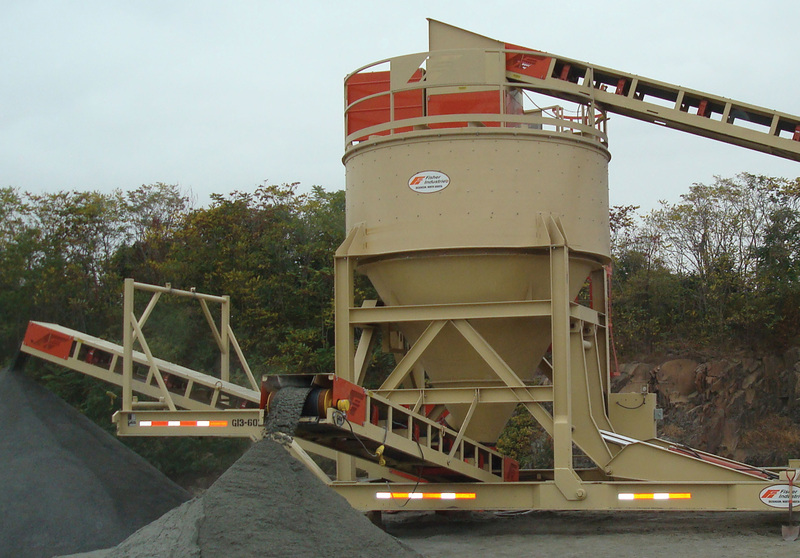 Concrete Recycling 20 HP model 400M drive under crusher conveyor on US mobile crushing/screening plant. 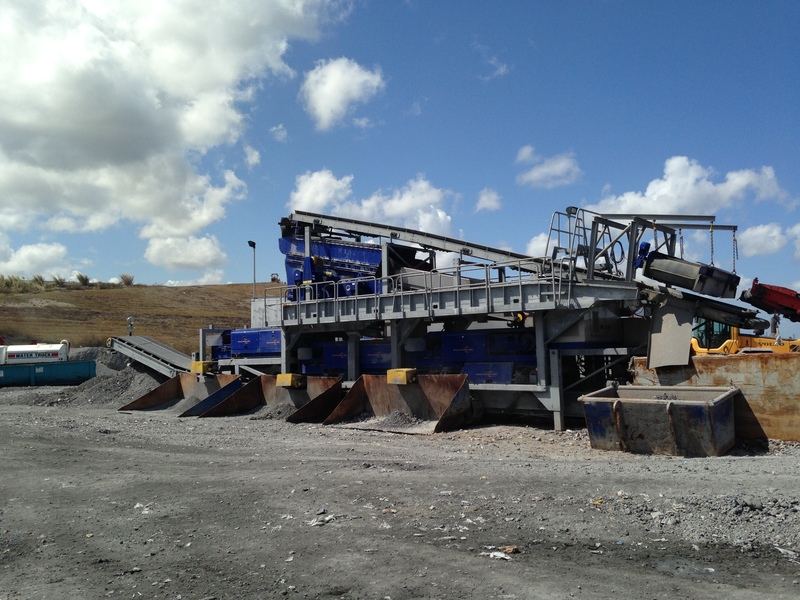 Concrete Recycling Model 320M drive cross conveyor & recirc conveyors on German crawler‐mounted mobile plant. 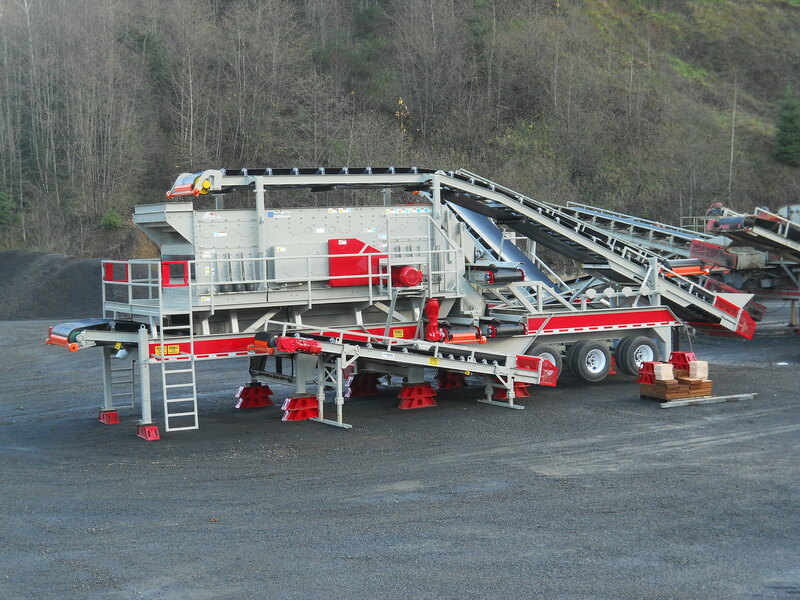 Road Construction Models 400M and 320M drive all conveyors on US mobile crushing/screening plant. 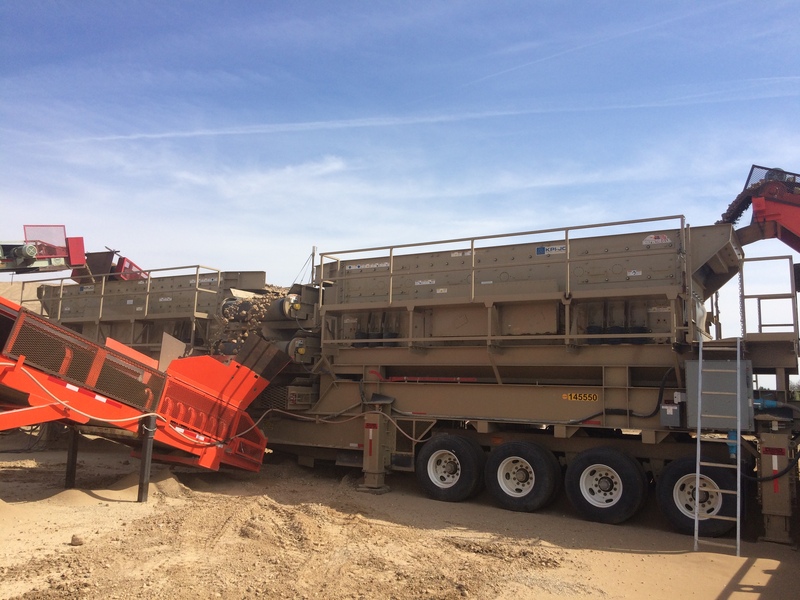 Sand Plant Model 320M drive all conveyors on US mobile cyclone sand separator plant. 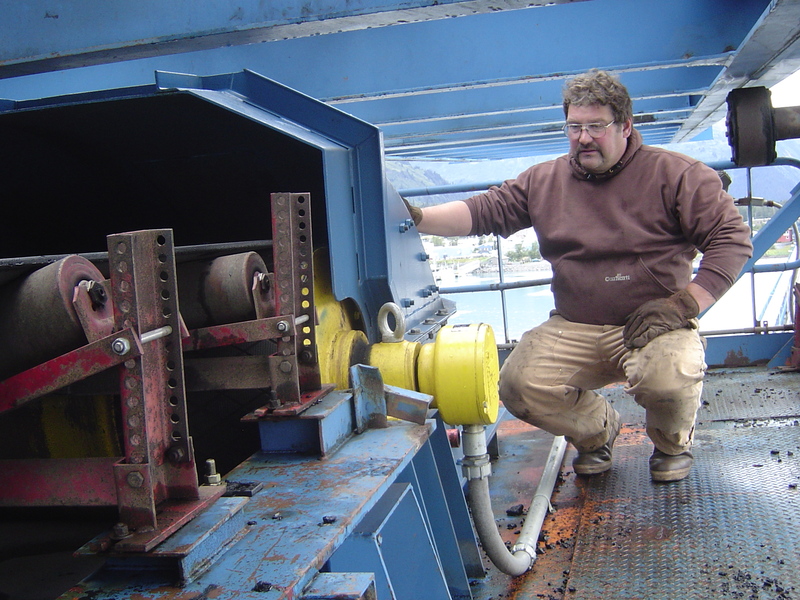 Ocean Dredging 50HP model 630H drive all conveyors in North Sea Ocean Dredge Ship. 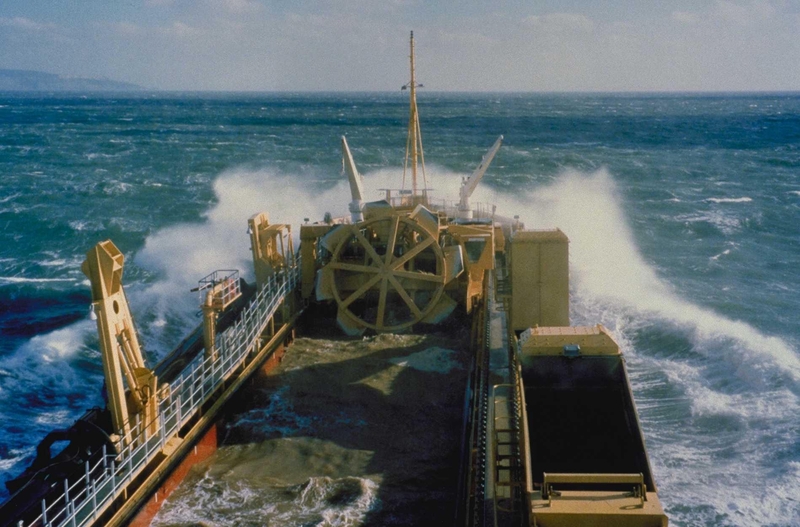 Ocean Dredging For more than 30 years Rulmeca Motorized Pulleys have driven conveyors on this dredge ship. 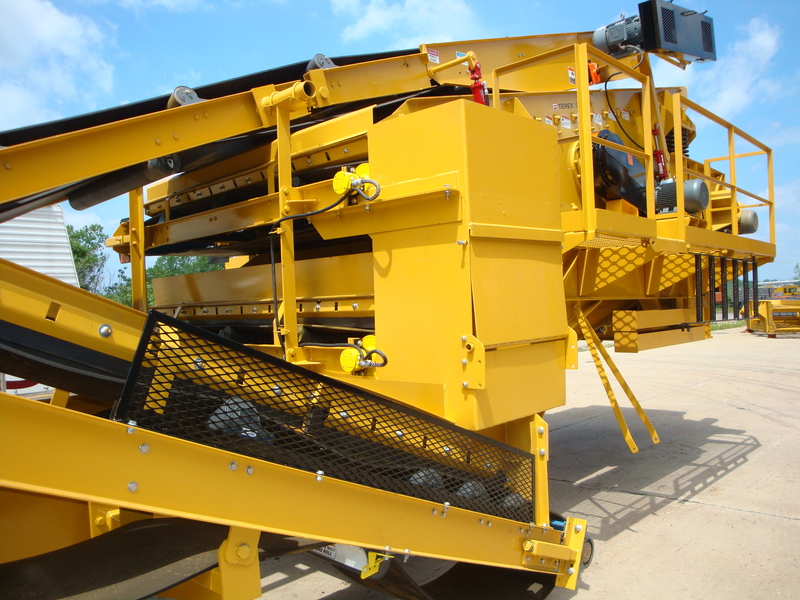 Overland Conveyor Two 100 HP model 800H, in dual drive arrangement drive this portable overland conveyor in England. 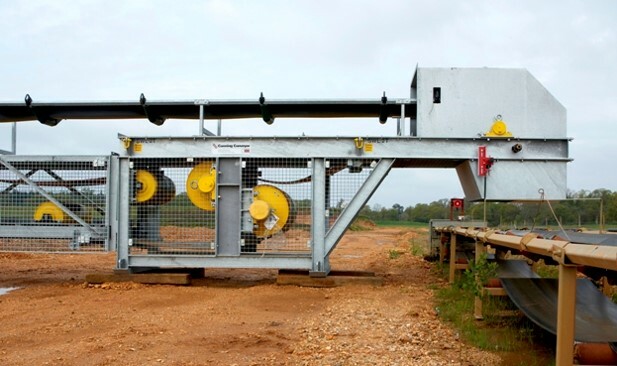 Overland Conveyor Two Motorized Pulleys and three "dead shaft" idler pulleys drive this UK overland conveyor. 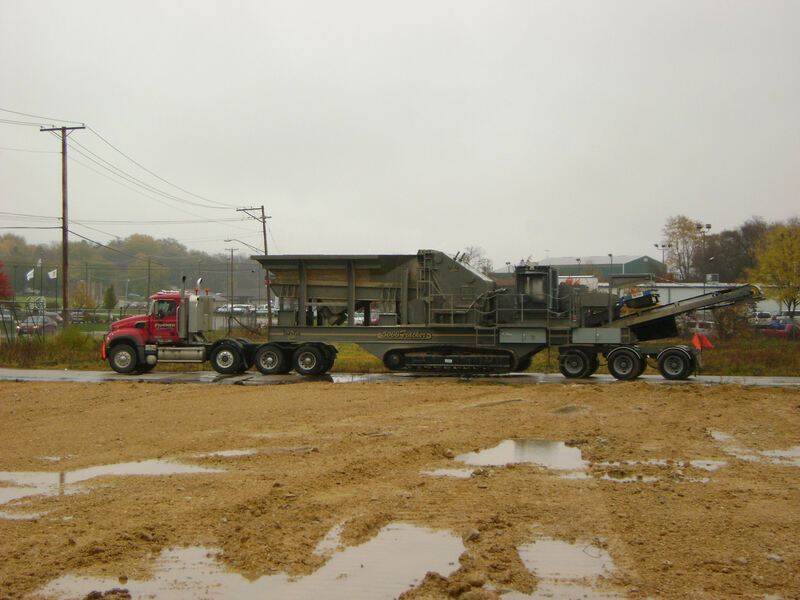 Road Construction 15 HP model 400M drive these six "stackable conveyors" at US road construction site. 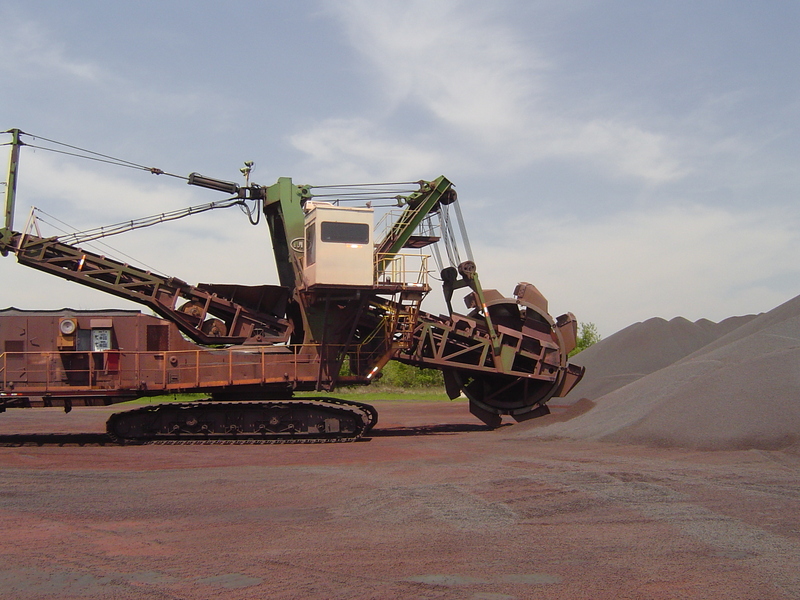 Iron Ore Terminal In 2007 this 40 year old bucket wheel reclaimer in Wisconsin was upgraded with 3 Rulmeca Motorized Pulleys at 120 HP/each. 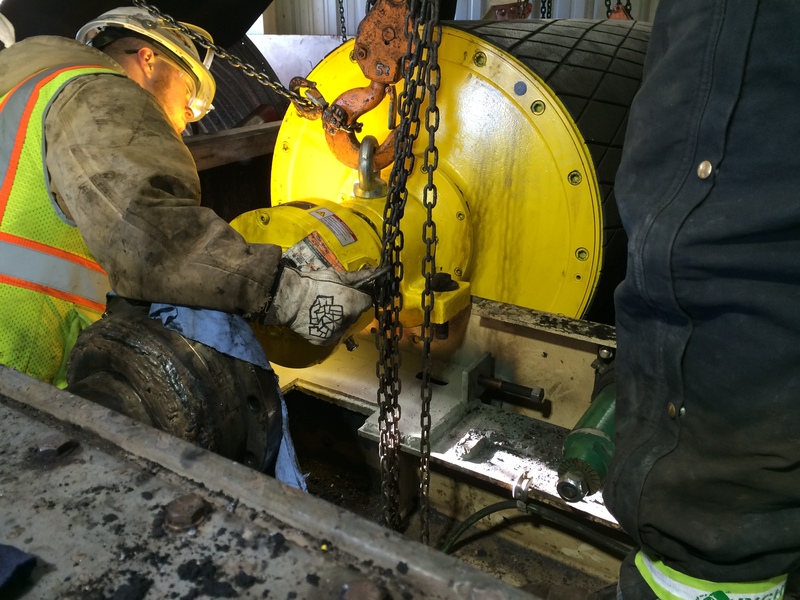 Iron Ore Terminal In 2016 this 30 year old bucket wheel reclaimer in Minnesota was upgraded with 3 Rulmeca Motorized Pulleys at 180 HP/each. 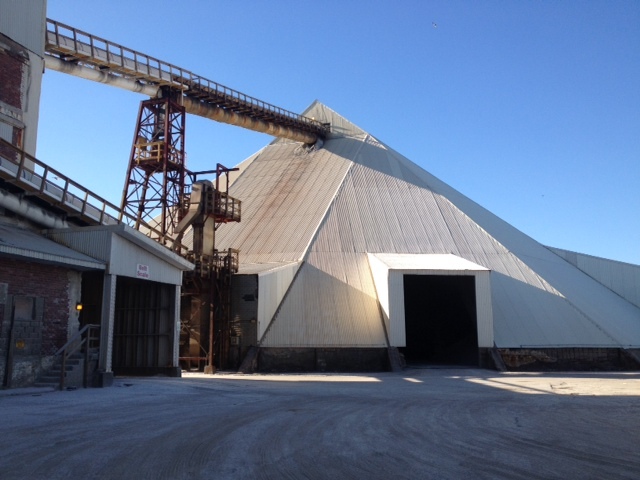 Iron Ore Terminal Installed in 2015, two 180 HP Rulmeca Motorized Pulleys, in "nested dual" arrangement, drive bucket wheel discharge conveyor. 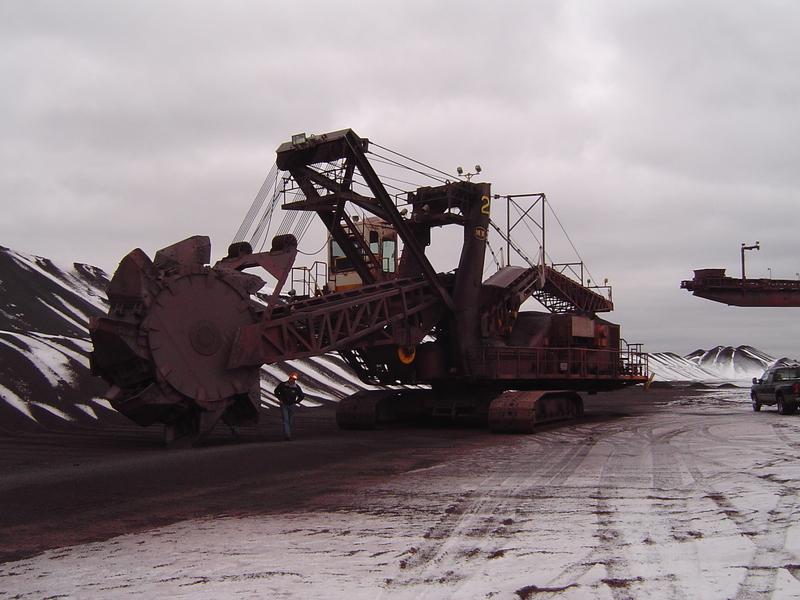 Iron Ore Terminal In 2004 this 40 year old bucket wheel reclaimer in Wisconsin was upgraded with 3 Rulmeca Motorized Pulleys at 120 HP/each. 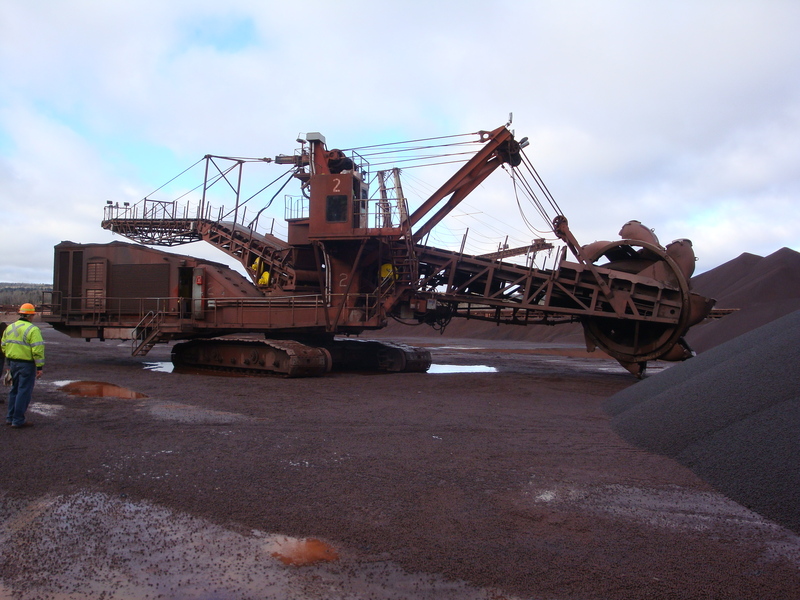 Iron Ore Terminal Two 120 HP Rulmeca Motorized Pulleys, in "nested dual" arrangement, drive bucket wheel discharge conveyor. 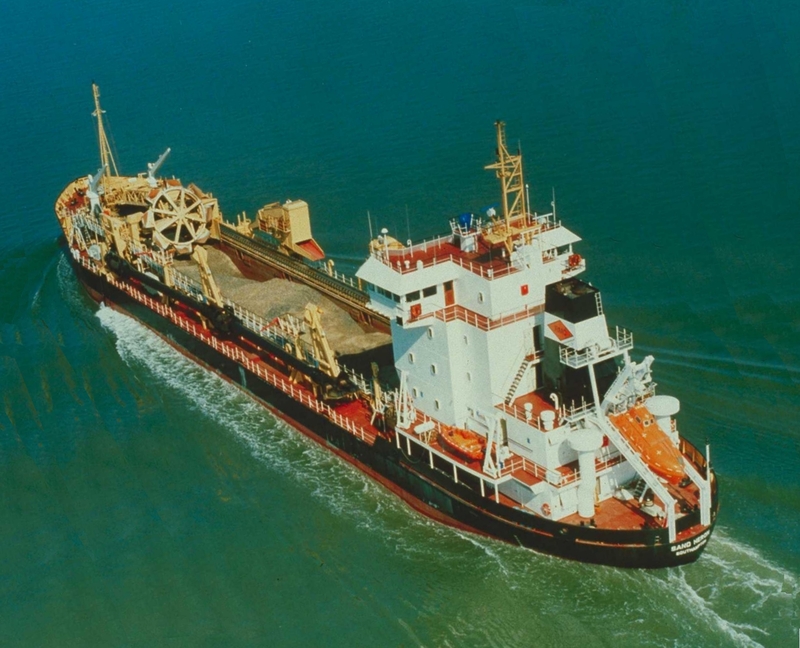 Iron Ore Terminal In 1985 this bucket wheel reclaimer in Michigan was upgraded with 2 Rulmeca Motorized Pulleys, moving more than 200 million tons since then. 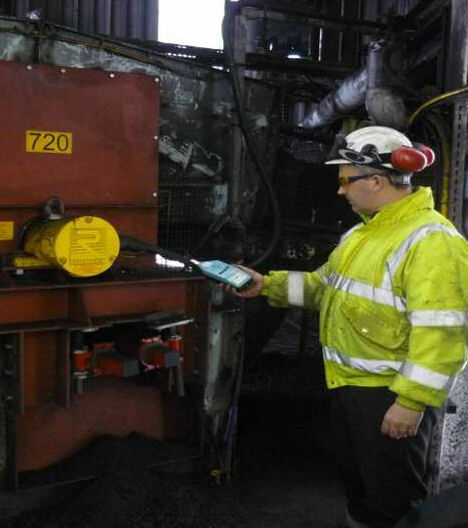 Coal Terminal 330 HP model 1000HD was installed at Hunterston Coal Terminal in 2011 in Fairlie Largs, Scotland. 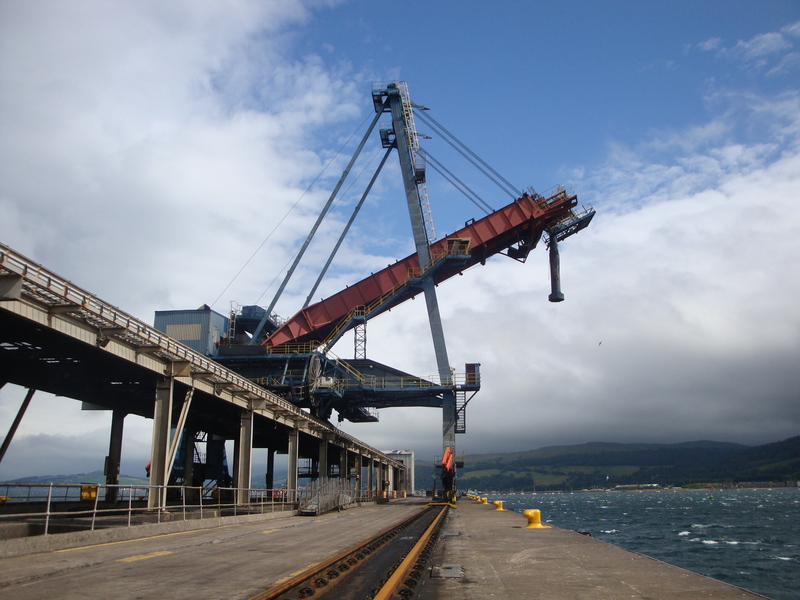 Coal Terminal Dock Conveyor at Hunterston Terminal during installation of 330 HP model 1000HD Motorized Pulley. 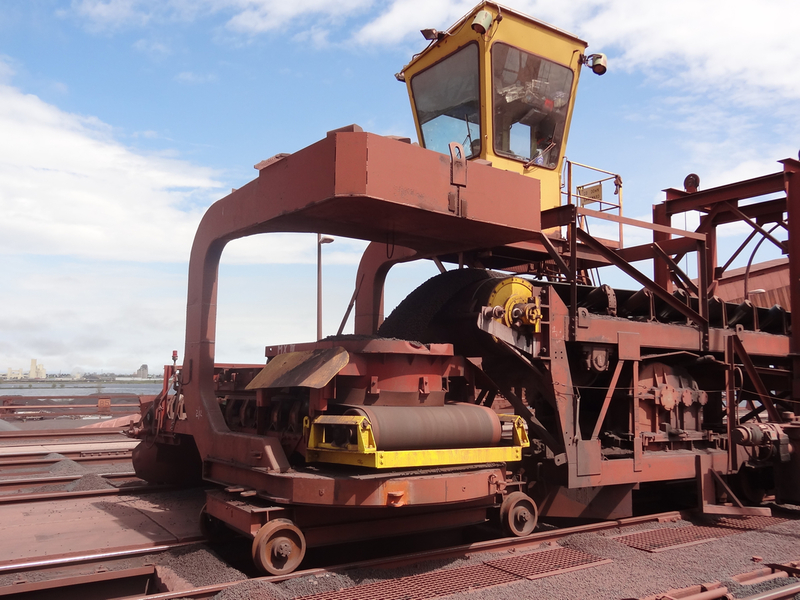 Iron Ore Terminal One of two 180HP Rulmeca Motorized Pulley upgraded reversing 10,000 tph iron ore dock shuttle conveyor in Duluth, MN. 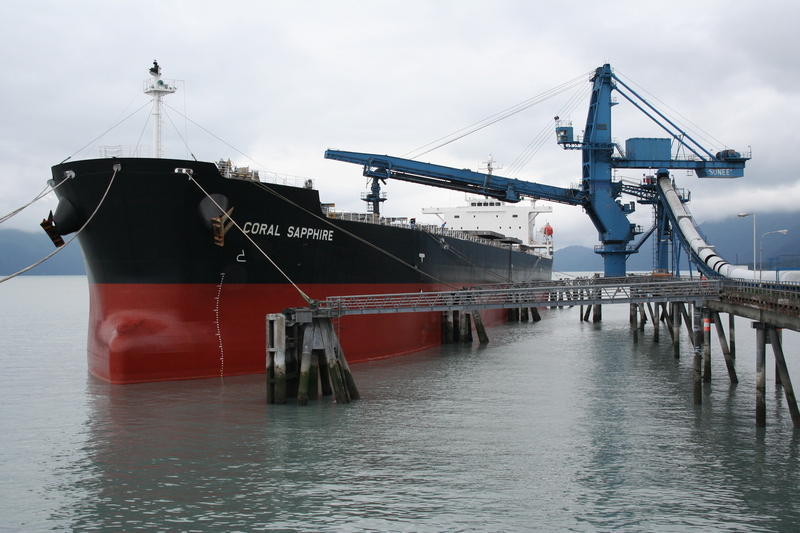 Coal Terminal Compact model 630H is ideal solution to upgrading Alaskan shiploader shuttle conveyor in congested apron. 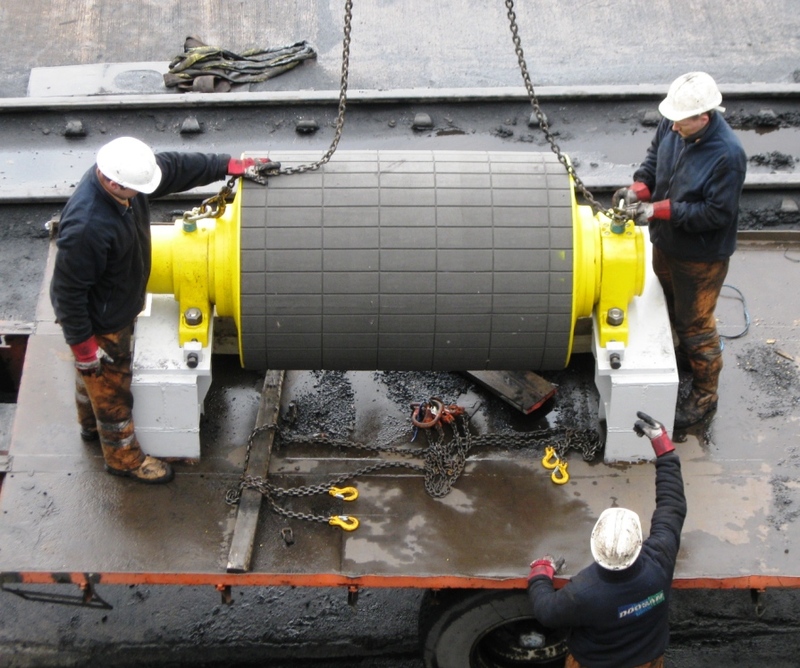 Coal Terminal In 2011 two 180 HP Rulmeca Motorized Pulleys were installed on 2,000 tph coal shiploader at deepwater Scottish port. 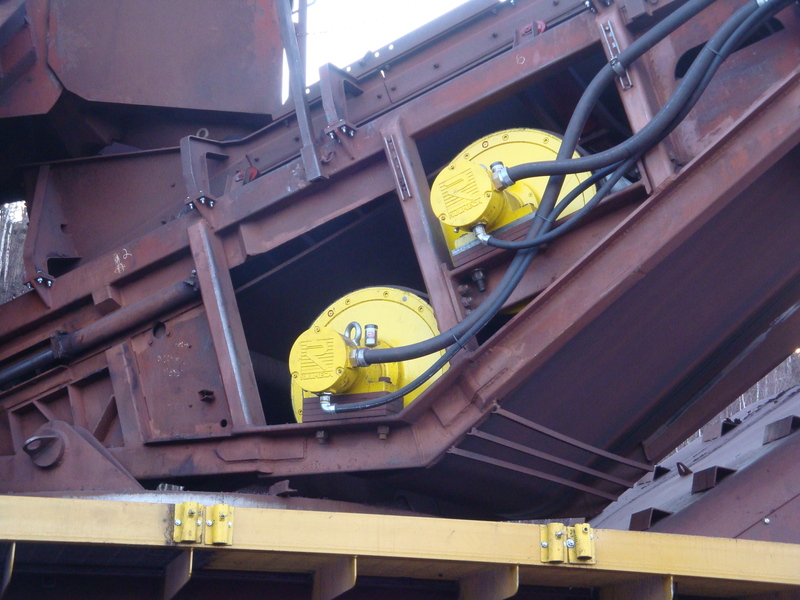 Coal Terminal Model 800HD 100 HP Rulmeca Motorized Pulleys drive bunker feed conveyors at Scottish ship to rail transfer terminal. 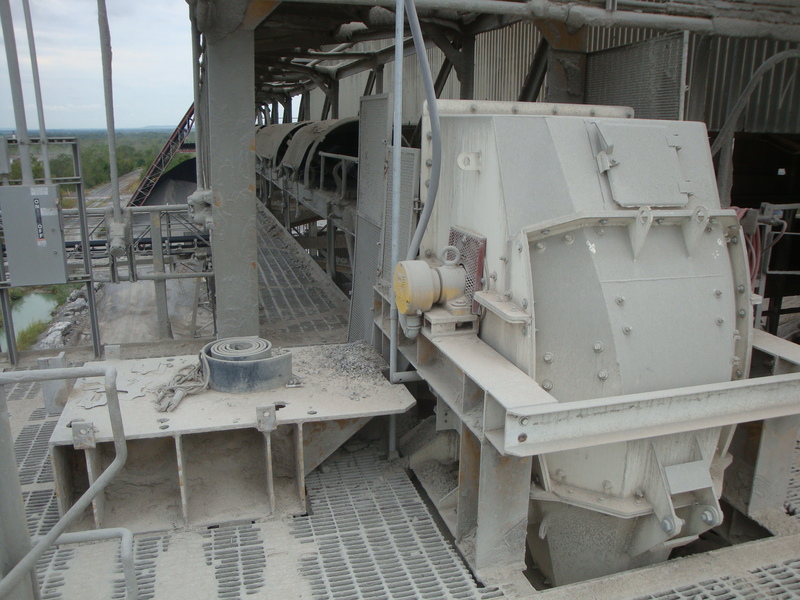 Cement Manufacturing Model 400M 10 HP Rulmeca Motorized Pulley drives sidewall feeder conveyor, controlled by VFD with wide frequency range. 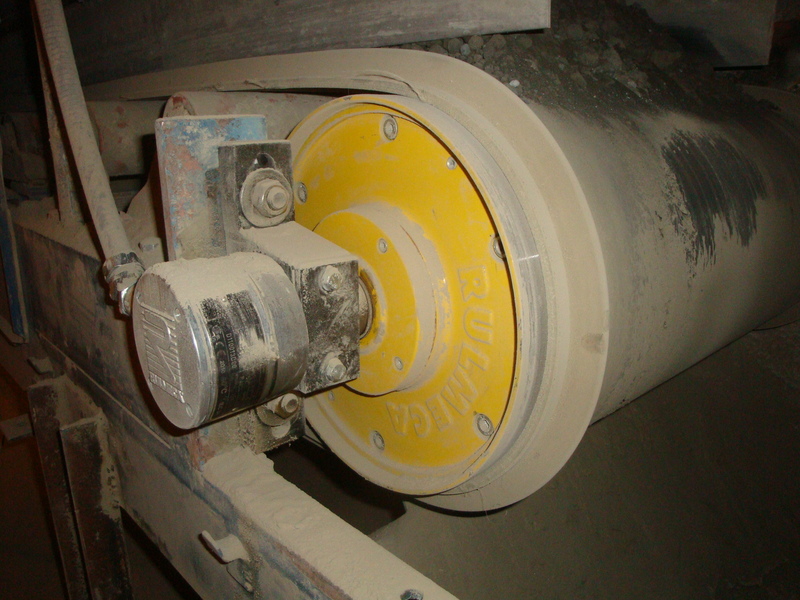 Cement Manufacturing Model 320H Rulmeca Motorized Pulley drives sidewall feeder conveyor, controlled by VFD with wide frequency range. 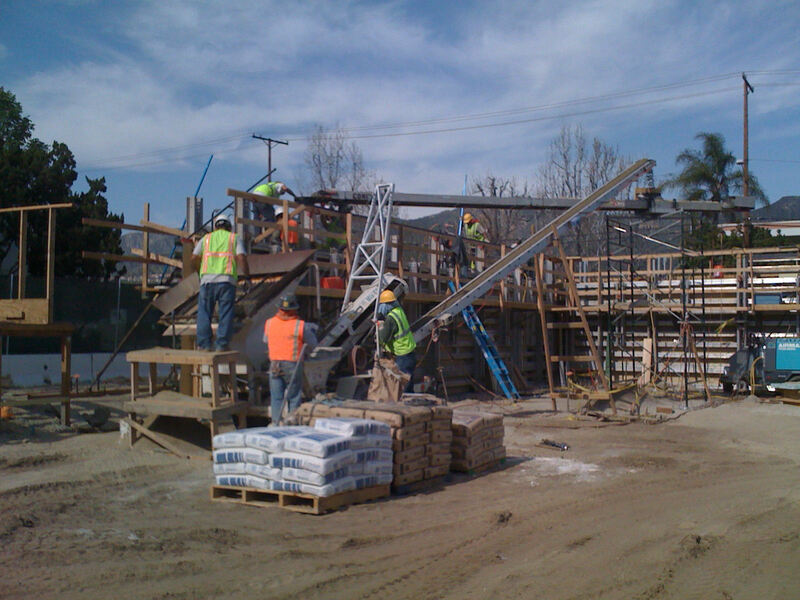 Cement Manufacturing Model 800H 100 HP Rulmeca Motorized Pulleys drive boom and tail conveyors on marl excavator in South Carolina. 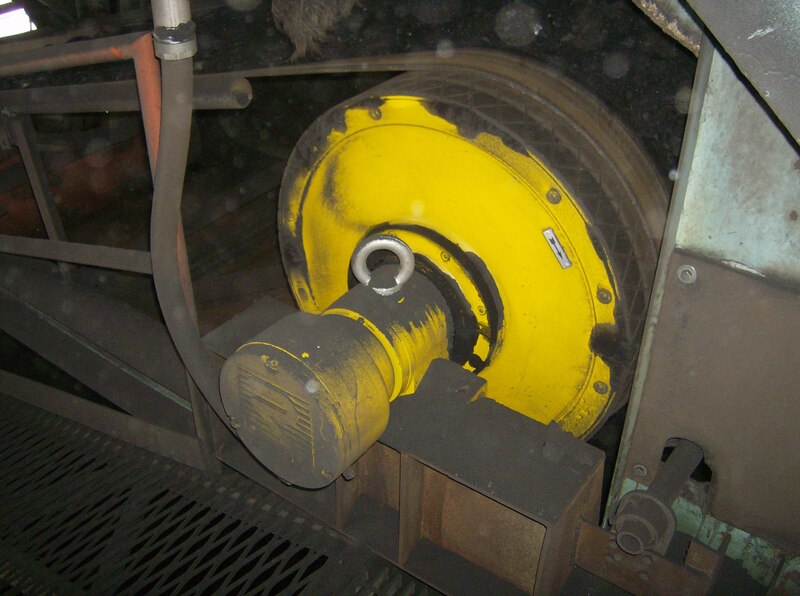 Cement Manufacturing External shoe brake for 100 HP model 800H Rulmeca Motorized Pulley provides "hold back" on articulating conveyor. 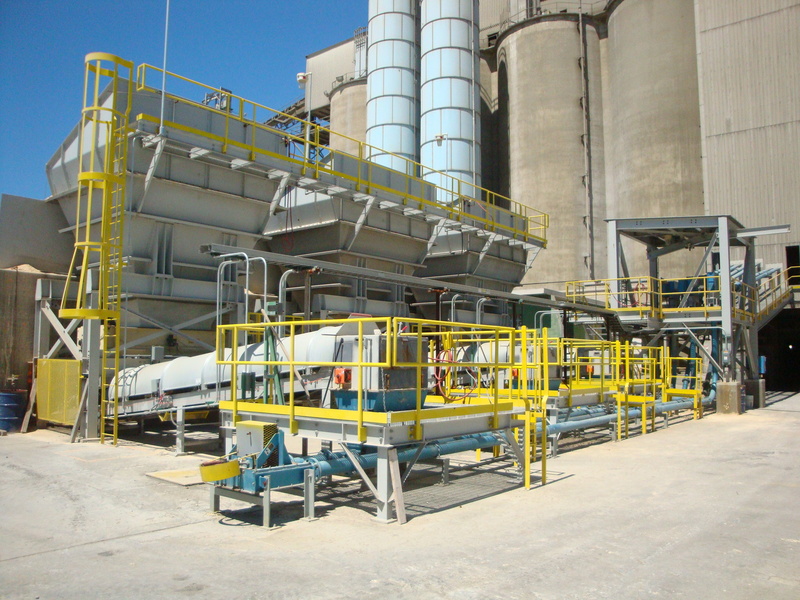 Cement Manufacturing Three model 220M Rulmeca Motorized Pulleys drive syngyp feed conveyors at cement plants in OK, IN, and MO. 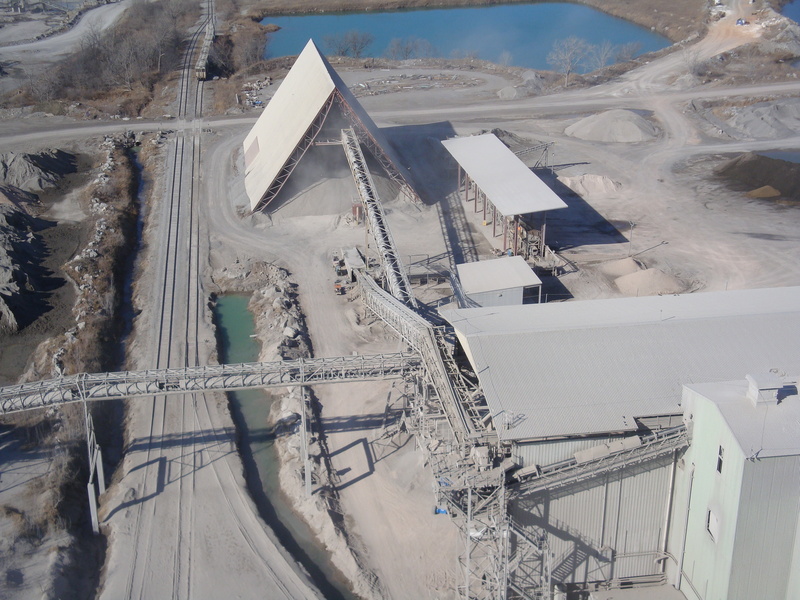 Cement Manufacturing Overview shows "dual drive" reclaim conveyor, with concave curve at tunnel exit, elevating high calcium hard rock. 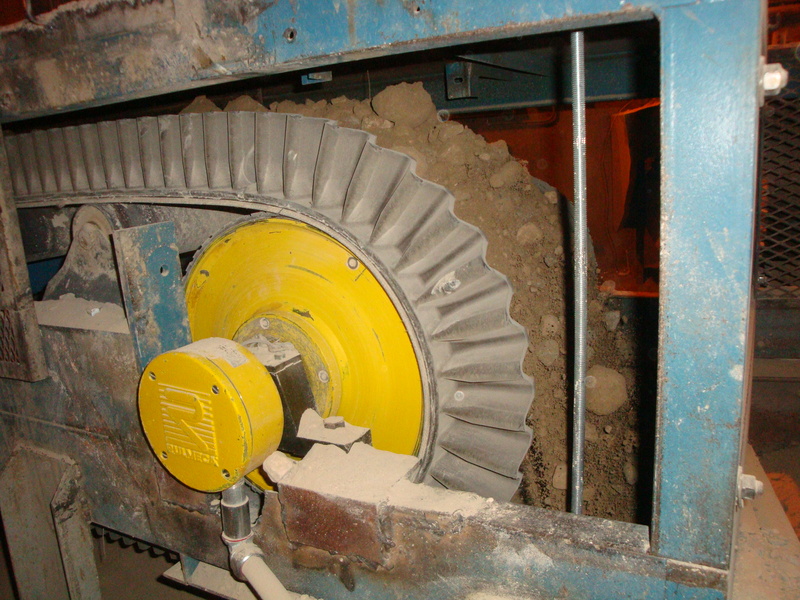 Cement Manufacturing Head Drive (one of two 50 HP model 630H Rulmeca Motorized Pulley) powering "dual drive" reclaim tunnel conveyor. 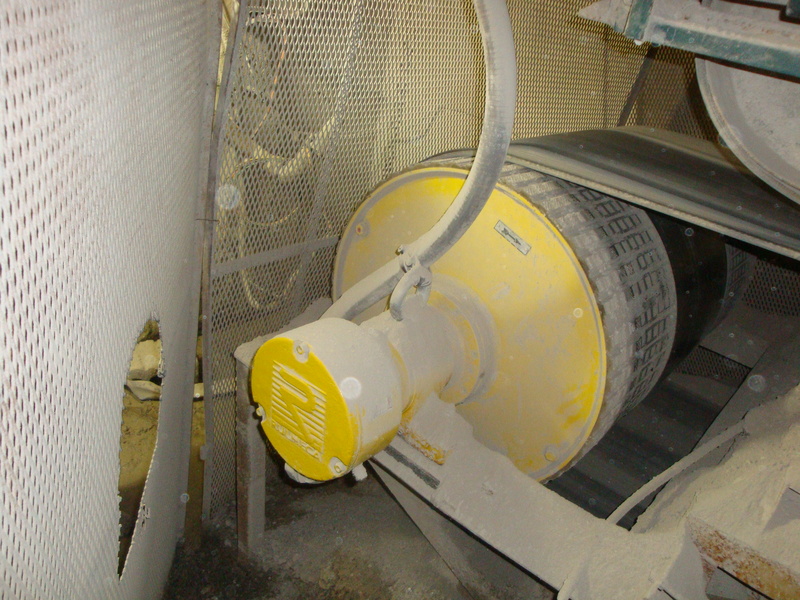 Cement Manufacturing Tail Drive (one of two 50 HP model 630H Rulmeca Motorized Pulley) powering "dual drive" reclaim tunnel conveyor. 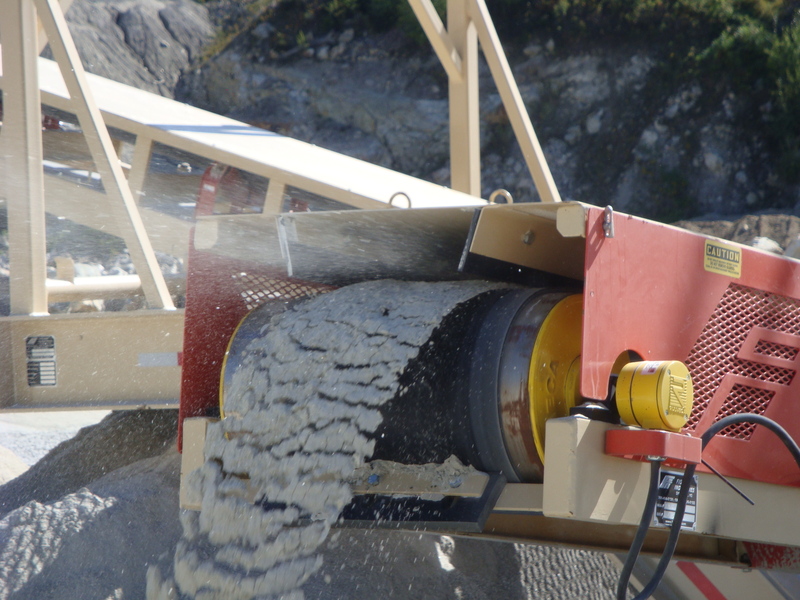 Cement Manufacturing High water table causes tunnel flooding with no adverse effect on 50 HP model 630H Rulmeca Motorized Pulley tail drive. 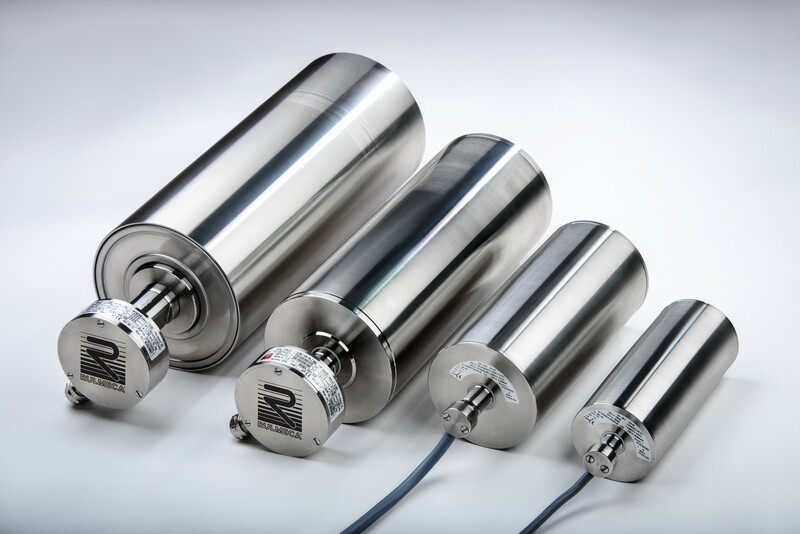 Portfolio Stainless steel drum motor food processing portfolio includes 165LS, 138LS, 113LS, and 80LS, all with IP68 sealing. 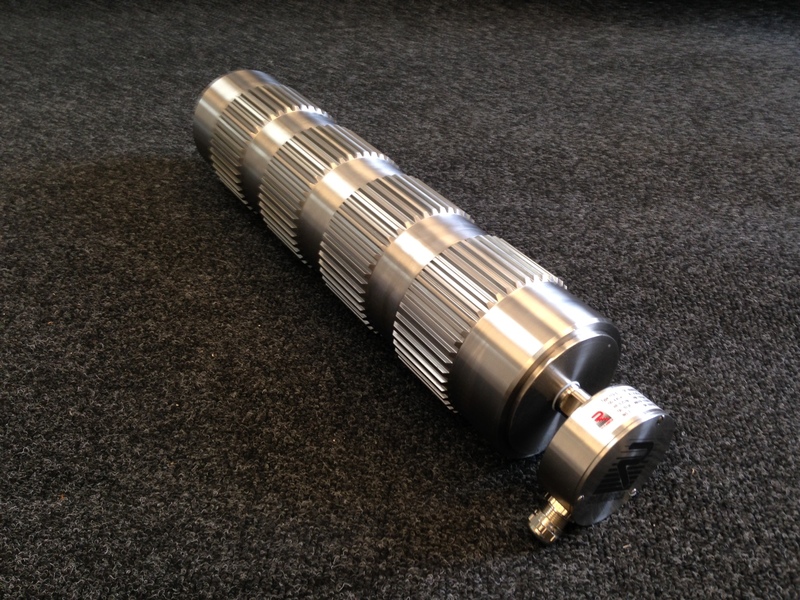 T10 Belt Drive Model 113LS in 0.5 HP Rulmeca Motorized Pulley in SS modified, to drive separate T10 belts to carry four lines of sausage. 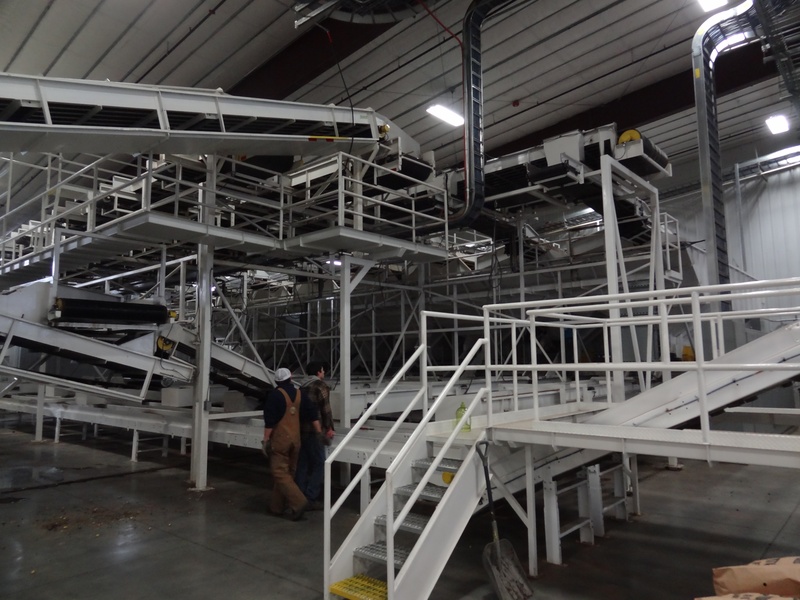 Potato Processing One of 47 Rulmeca Motorized Pulleys (models 220M and 320M) installed in 2009 at Washington potato handling facility. 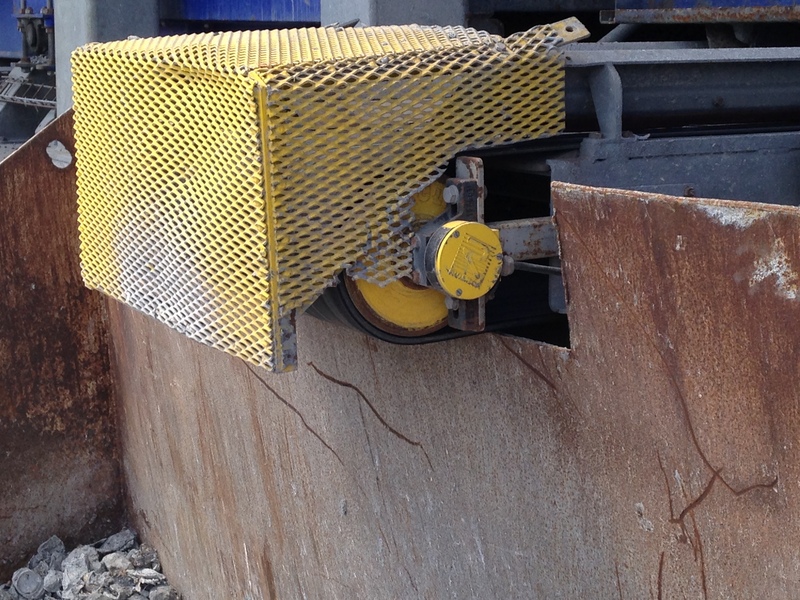 Potato Processing Compact, hygienic design of Rulmeca Motorized Pulleys is displayed at major potato processing plant. 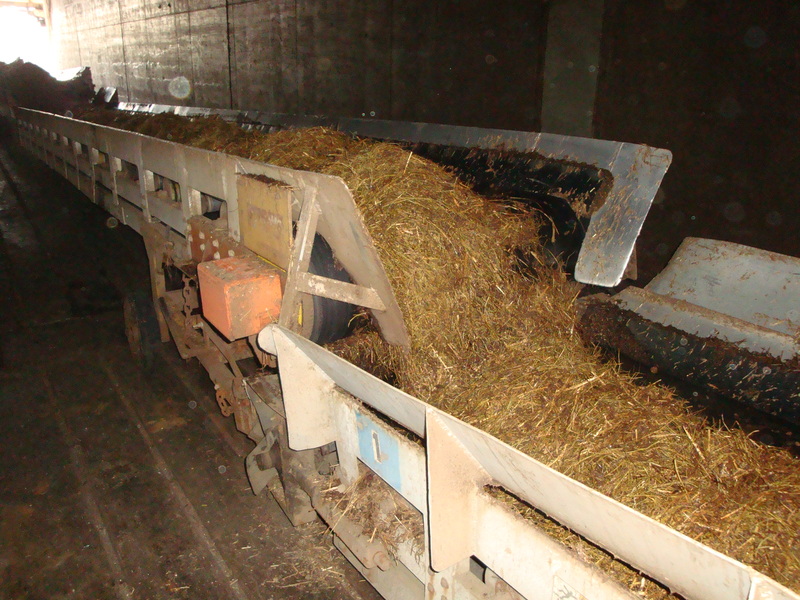 Mushroom Farm One of 24 model 320M Rulmeca Motorized Pulleys installed in 2009 on cascading conveyors in mushroom soil composting in Pennsylvania. 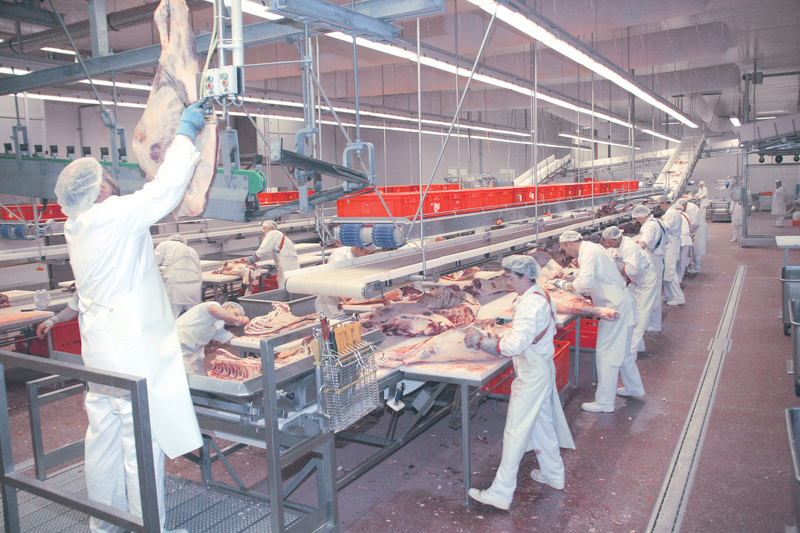 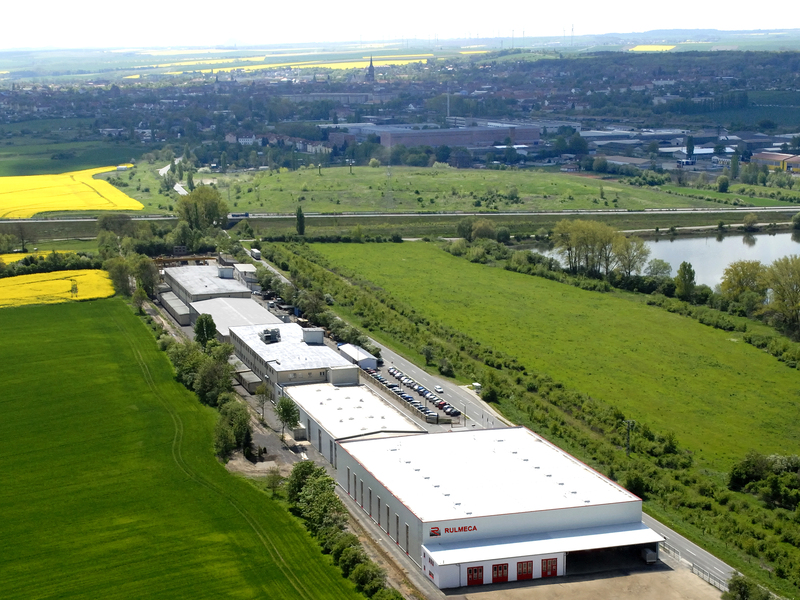 Meat Production Rulmeca stainless steel Motorized Pulleys drive positive drive belts and segmented belts at this Danish meat processing plant. 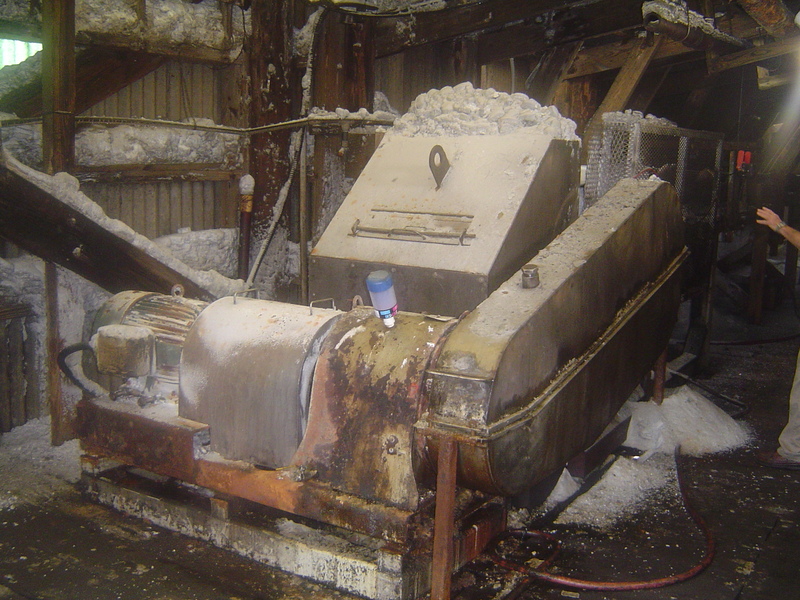 Gourmet Salt Processing Stainless steel 0.5 HP Rulmeca Model 113LS Motorized Pulley with 17 grooves drives positive drive belt at gourmet salt plant. 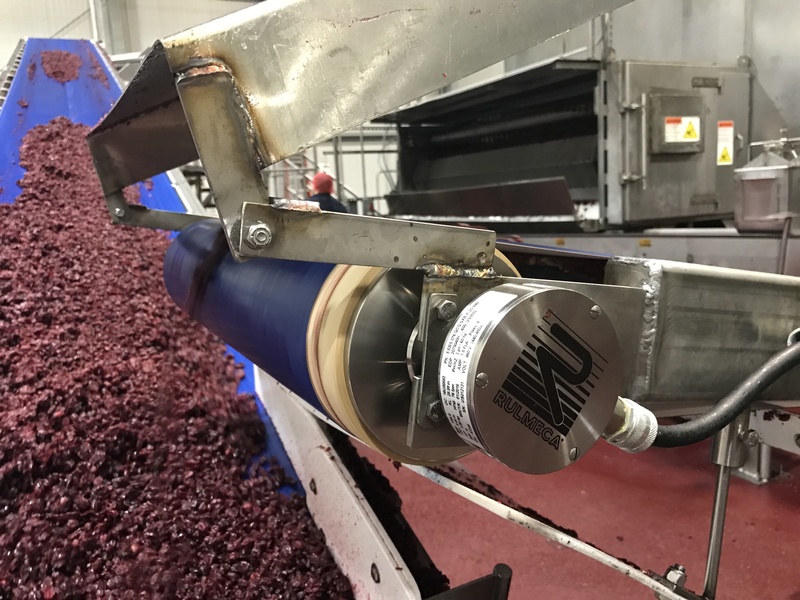 Cranberry Processing Model 165LS 1 HP Rulmeca Motorized Pulley features IP69 sealing, SS exterior, and white food grade lagging for all primary conveyors. 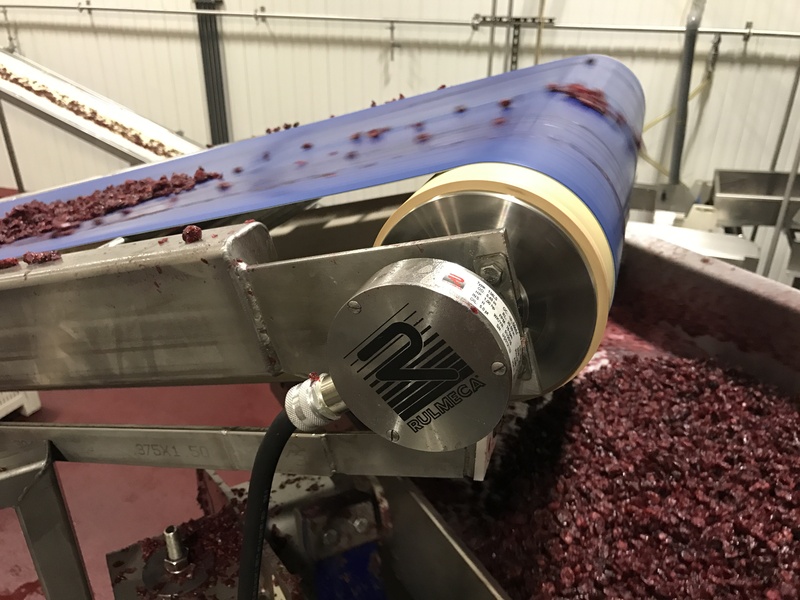 Cranberry Processing Reduced weight and centered mass of model 165LS Rulmeca Motorized Pulley simplified cantilevered conveyor design. 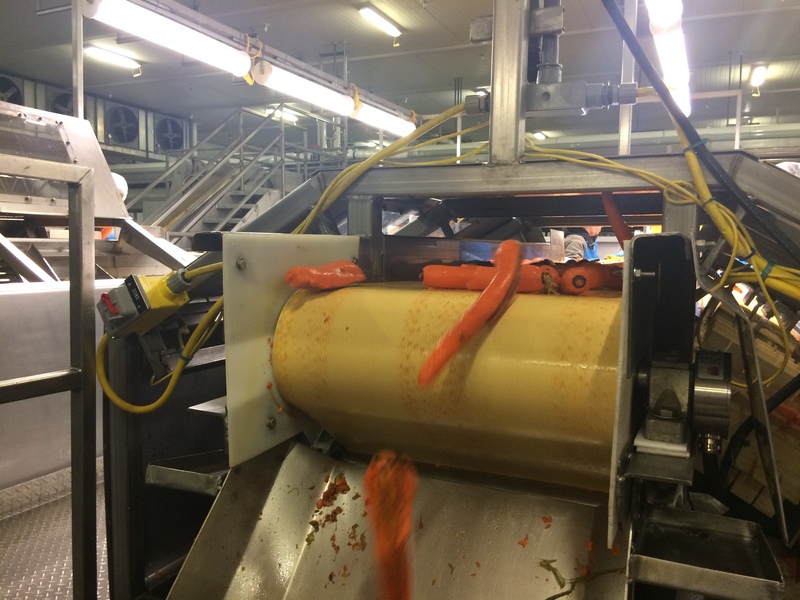 Carrot Processing Major California carrot processing facility uses Rulmeca Motorized Pulleys in various locations within the huge plant. 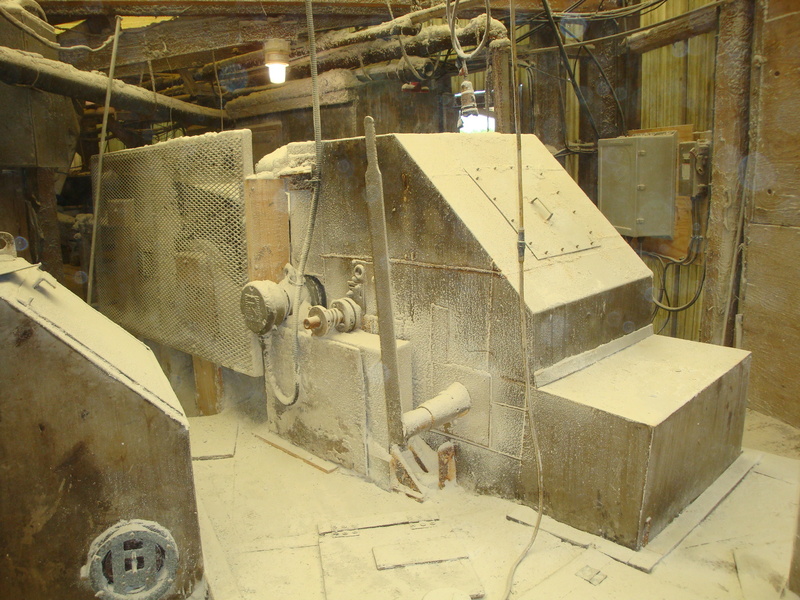 Gourmet Salt Processing Improved SS 0.5 HP Rulmeca Model 113LS Motorized Pulley with 34 grooves drives positive drive belt at gourmet salt plant. 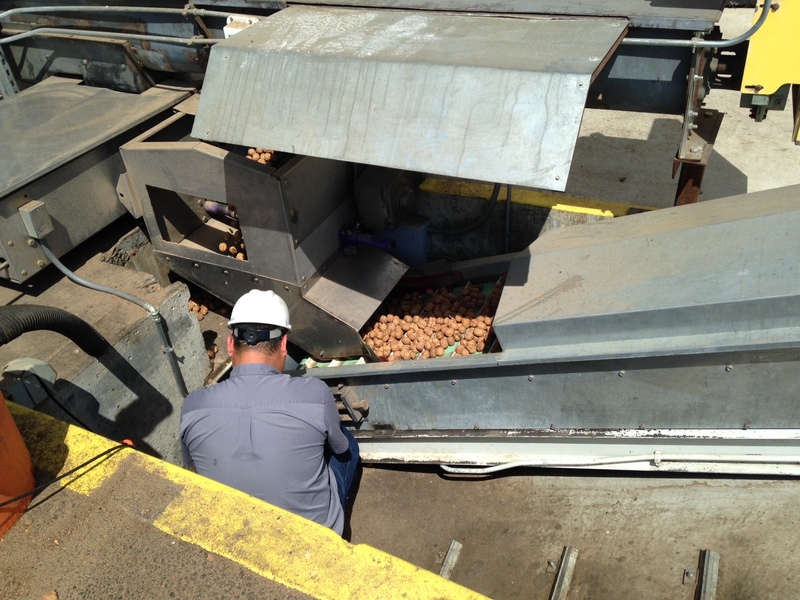 Walnut Processing Major California walnut producer converted primary conveyor to Rulmeca Motorized Pulleys in dual drive configuration to eliminate belt slippage. 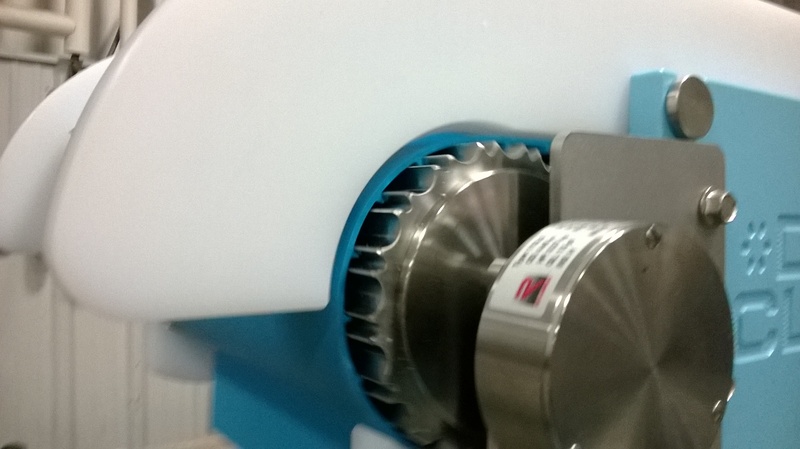 Positive Belt Drive Currently under development, new shell material offers advantages to Rulmeca Motorized Pulleys driving segmented belts. 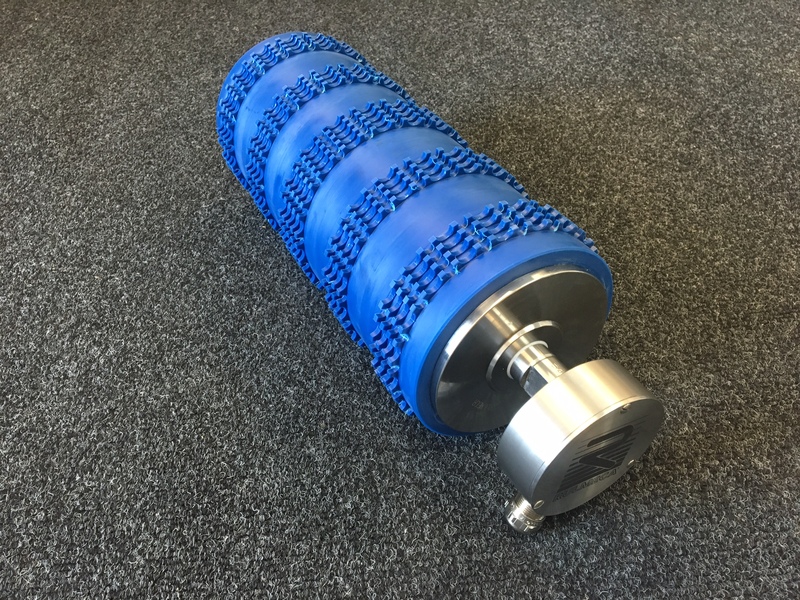 Positive Belt Drive This 0.5 HP Rulmeca Motorized Pulley features a new low friction, hygienic shell material to power positive drive belts. 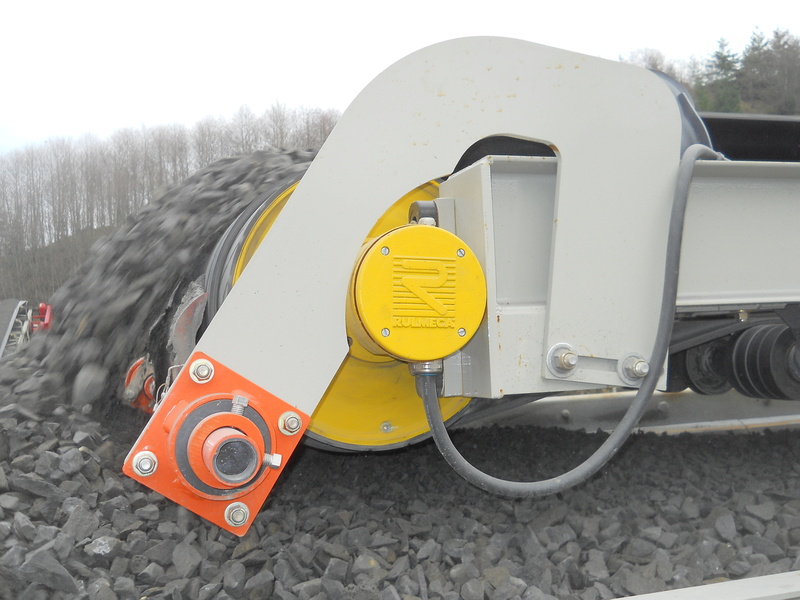 Positive Belt Drive Various lagging types and colors are available, including smooth, diamond pattern, and profiled for positive drive belts. 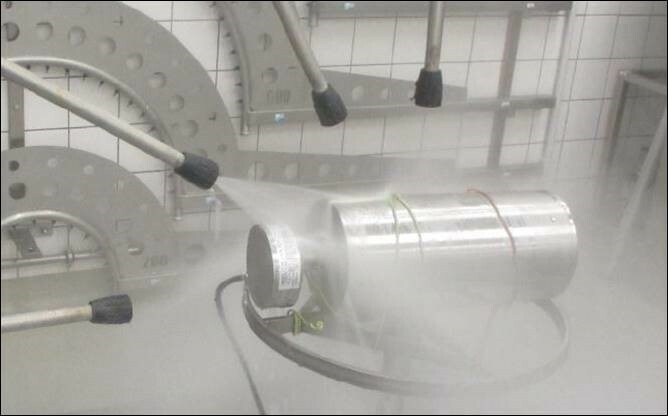 IP69 Certification Certified IP69 sealing system protects Rulmeca Motorized Pulleys from ingress of water during high temperature and pressure steam-cleaning procedures. 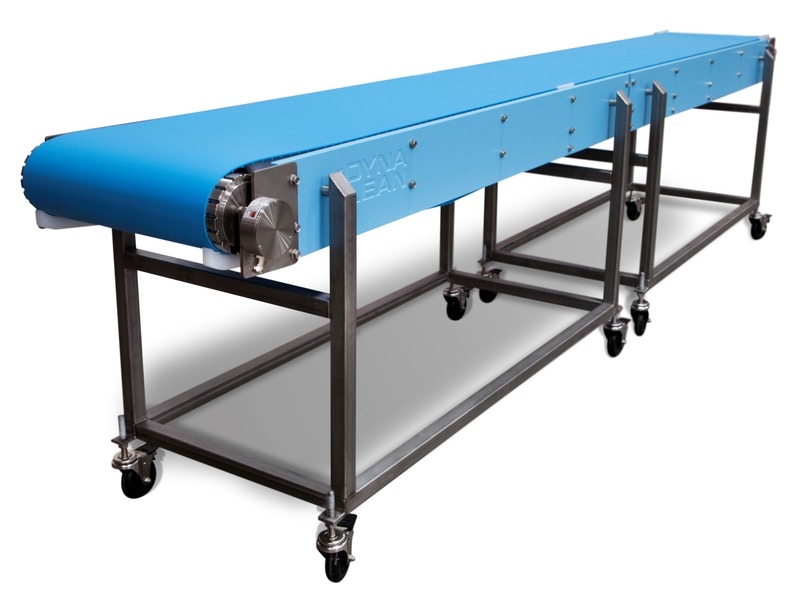 Wash Down Conveyor This "Toolless" conveyor, featuring a Rulmeca Motorized Pulley, may be quickly disassembled and cleaned. 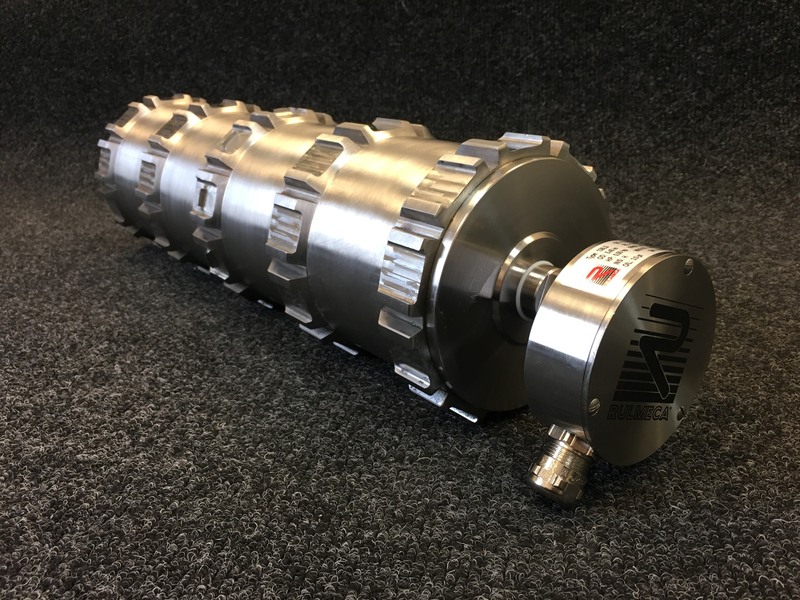 Bakery This positive drive belt is powered by 0.5 HP model 113LS Rulmeca Motorized Pulley with thick-wall shell and special grooves. 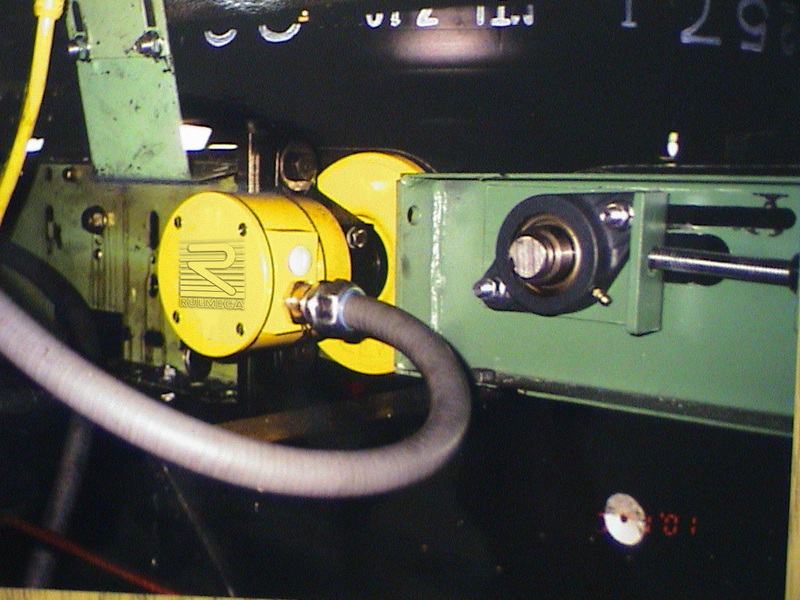 Cranberry Processing Rulmeca Motorized Pulley, model 133LS, with acetal shell and SS end housings, shafts, and terminal box powers positive drive belt. 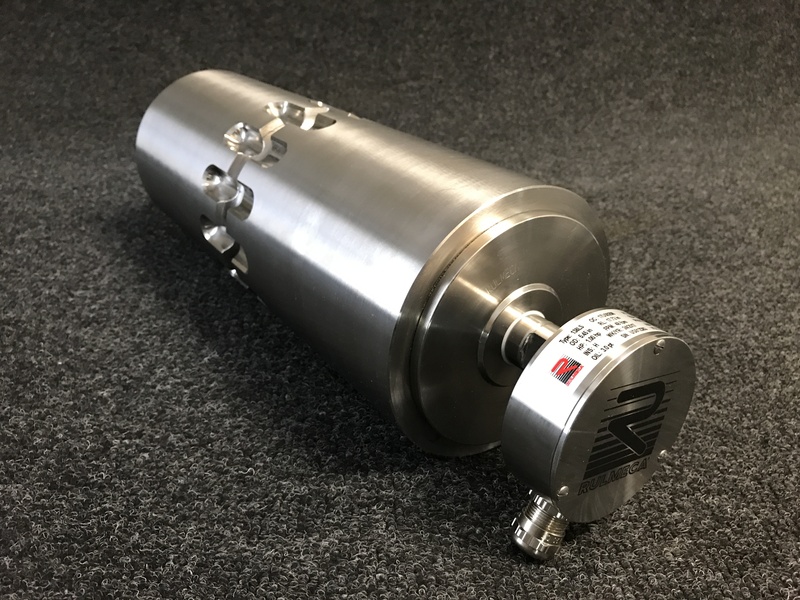 Positive Belt Drive This 1 HP Rulmeca Motorized Pulley features 100% stainless steel exterior to power positive drive belts. 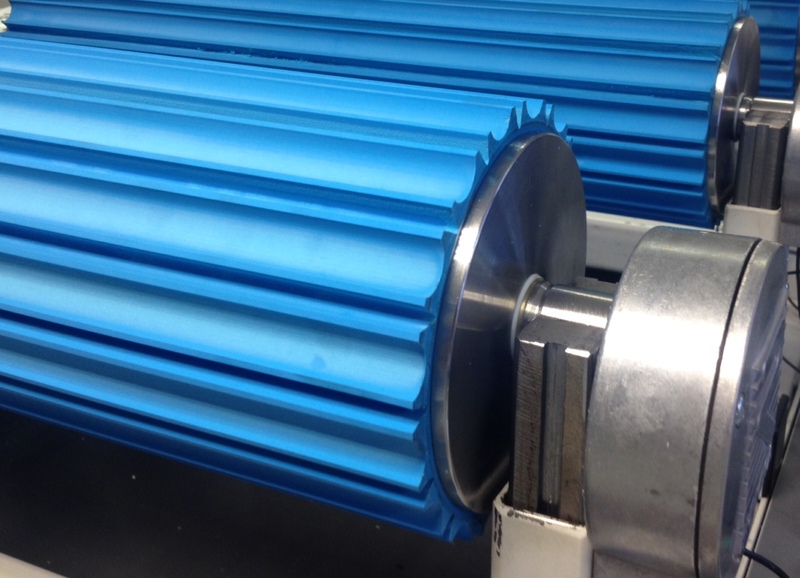 Segmented Belt Drive 100% stainless steel Rulmeca Motorized Pulley drives segmented belt in fresh cut vegetable processing plant. 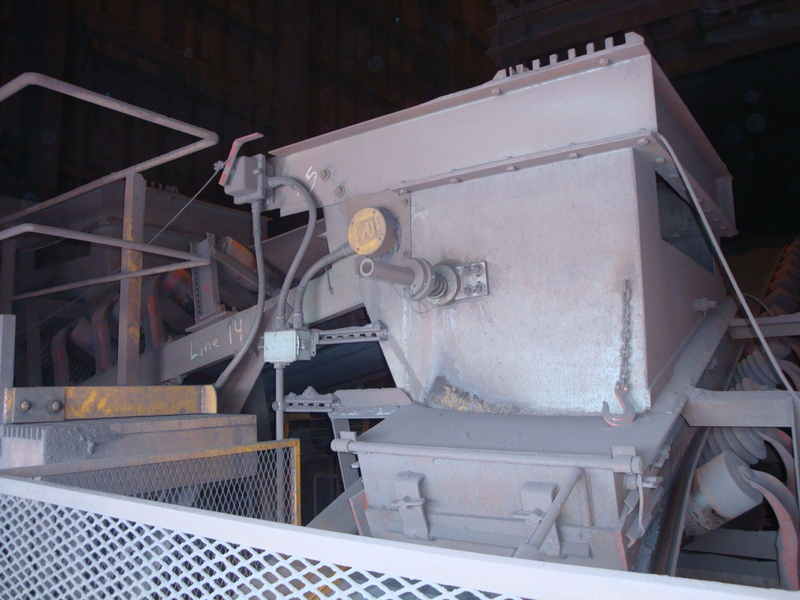 Iron Ore Production Installed 2011, Model 800H 122 HP Motorized Pulleys drive two taconite conveyors with high temp and 95% humidity. 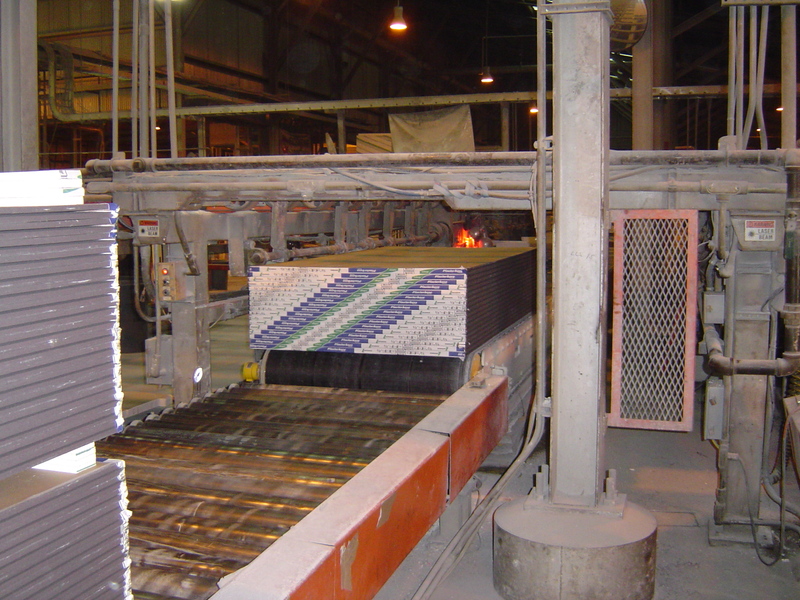 Steel Making Installed 2006, Model 630H 15 HP Rulmeca Motorized Pulley drives sinter stacking conveyor at Chicago lake front steel mill. 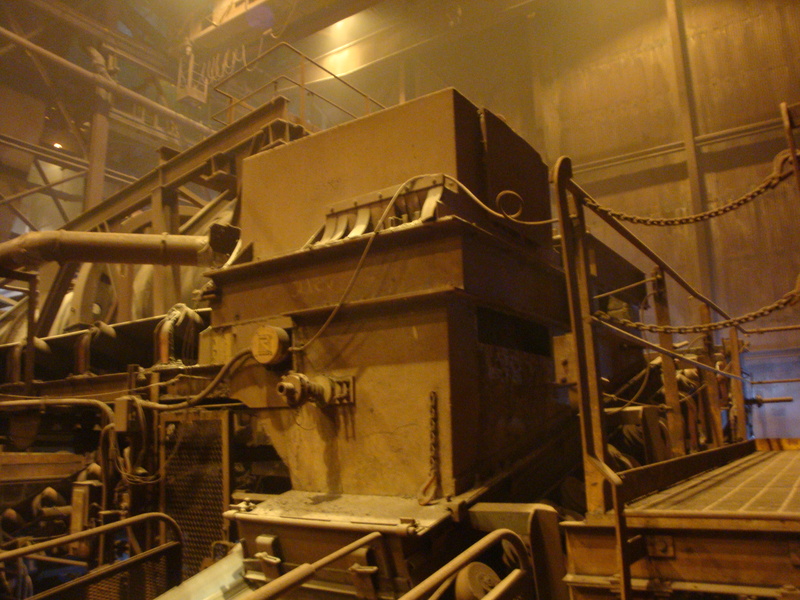 Steel Making Installed in 2005, Model 630H 30 HP Rulmeca Motorized Pulley drives sinter conveyor at Chicago lake front steel mill. 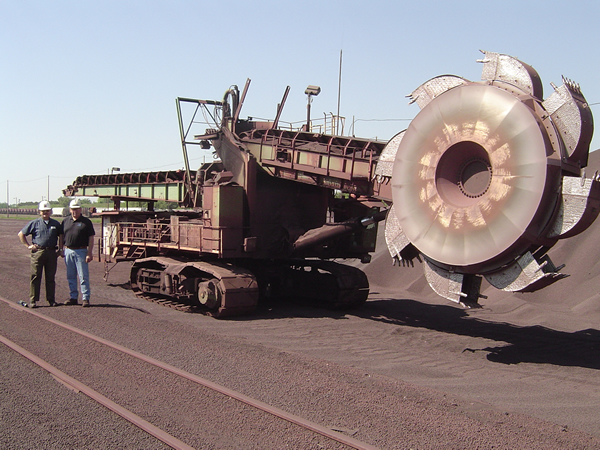 Iron Ore Production One of 82 model 400H Rulmeca Motorized Pulleys at 7.5 HP and 15 HP supplied in 2006 to Michigan iron mine. 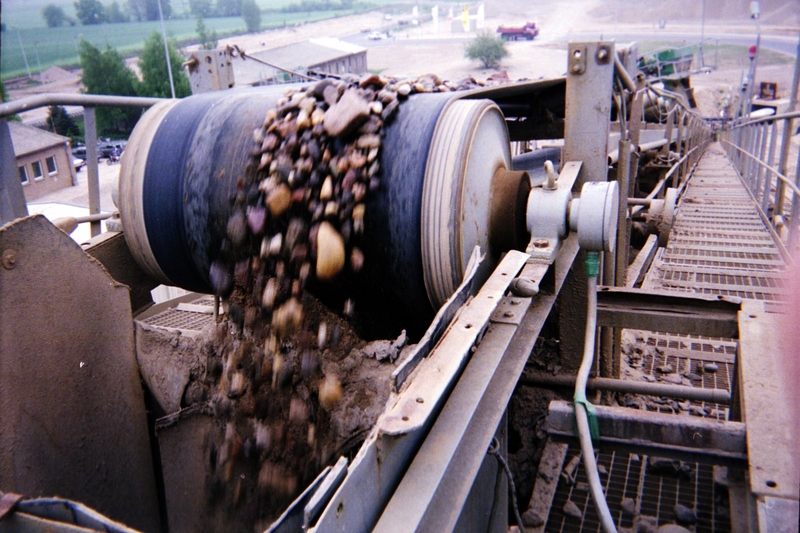 Iron Ore Production One of 32 model 500H Rulmeca Motorized Pulleys at 10 HP and 25 HP supplied in 2008 to Michigan iron mine. 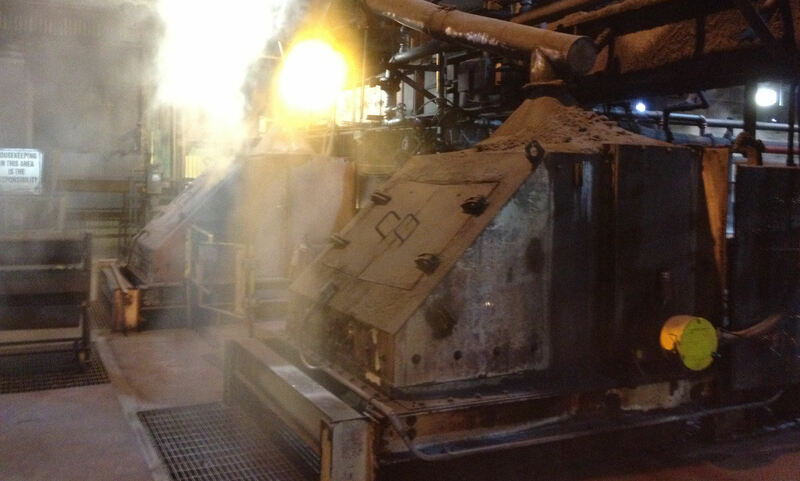 Iron Ore Production Typical Rulmeca Motorized Pulley supplied to major US iron mines includes regreasable labyrinth seals. 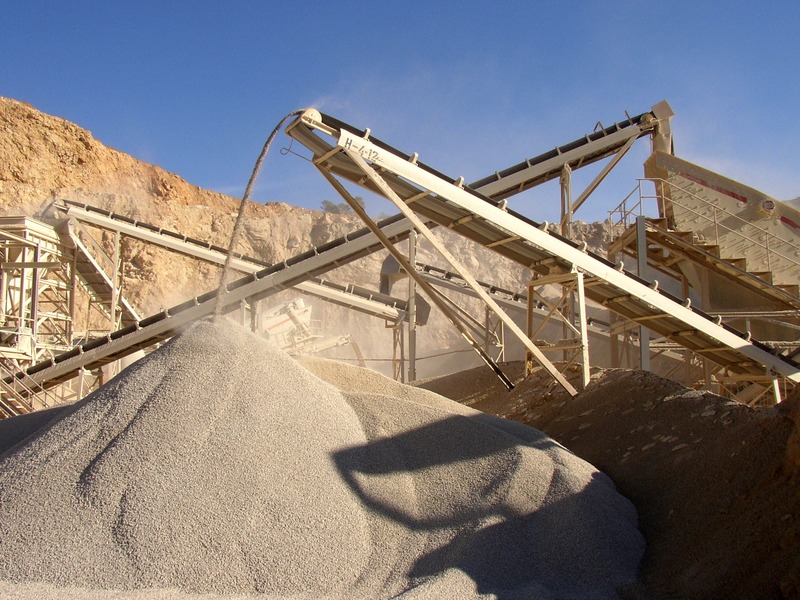 Phosphate Production one of six model 400M 15 HP Rulmeca Motorized Pulley calciner feed conveyor drives supplied to US phosphate mine. 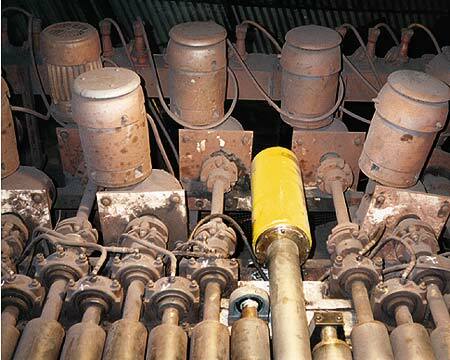 Sewage Treatment Model 220M SS Rulmeca Motorized Pulley drives filter press belt. 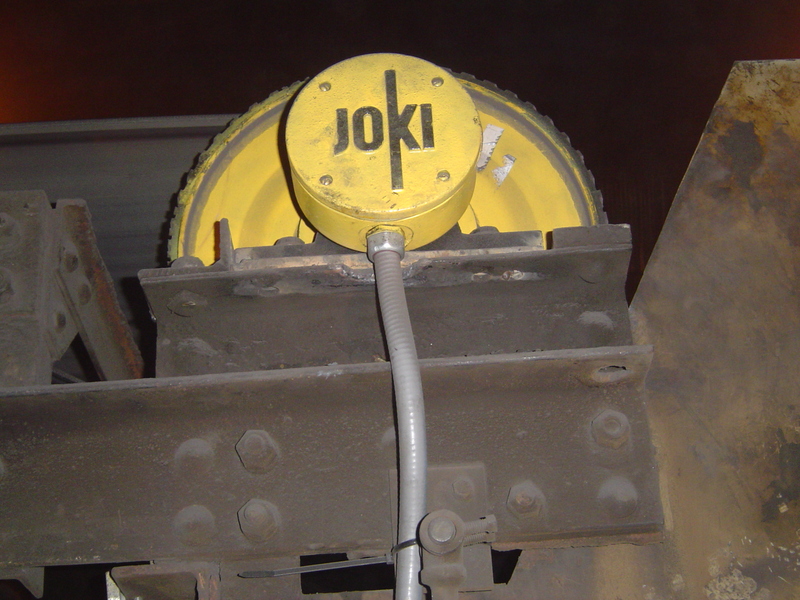 Model 165LS SS drives sludge cake collector belt in Florida. 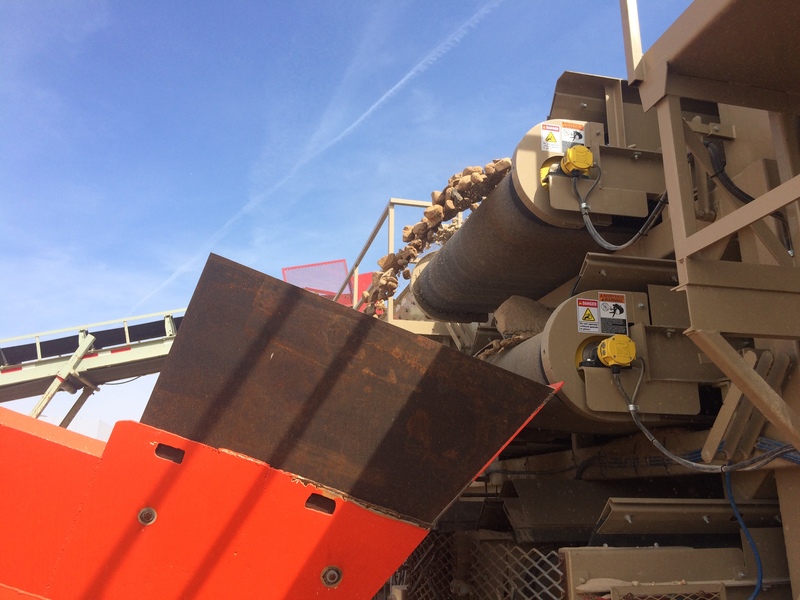 Woodchip Production Installed in 2010 in North Carolina, two 15 HP model 400M drive reversing woodchip bin feed conveyor from head and tail positions. 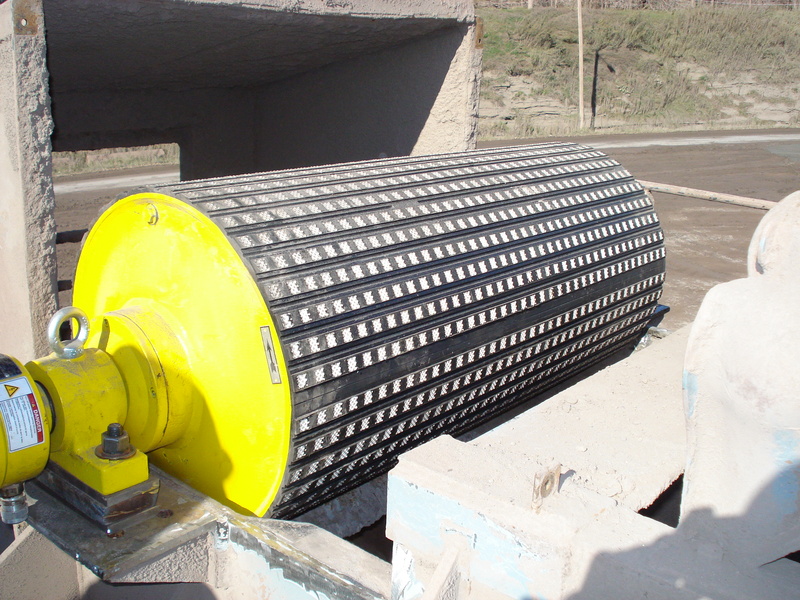 Iron Ore Production Patented taconite pellet roll feeder design has modified model 220M Rulmeca Motorized Pulley driving each 12 ft long roll. 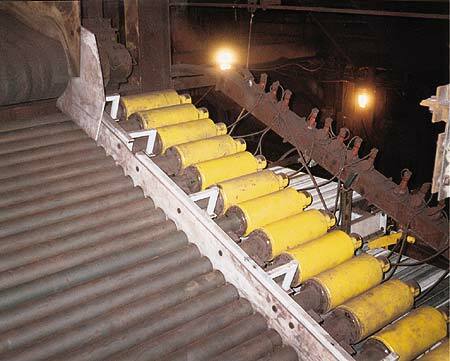 Iron Ore Production 1995 prototype tests verified that model 220M Rulmeca Motorized Pulley could replace all external components. 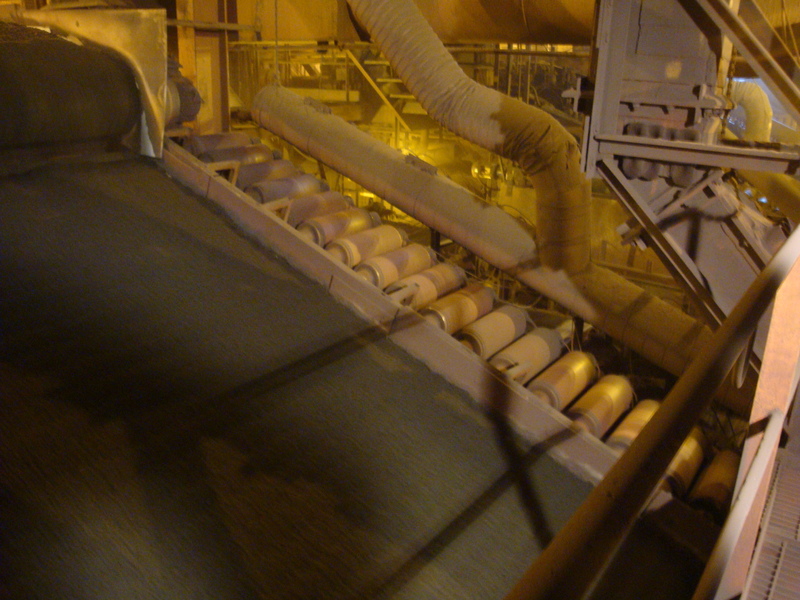 Iron Ore Production Green taconite pellets cascade down feeder rolls, which are driven by model 220M Rulmeca Motorized Pulleys. 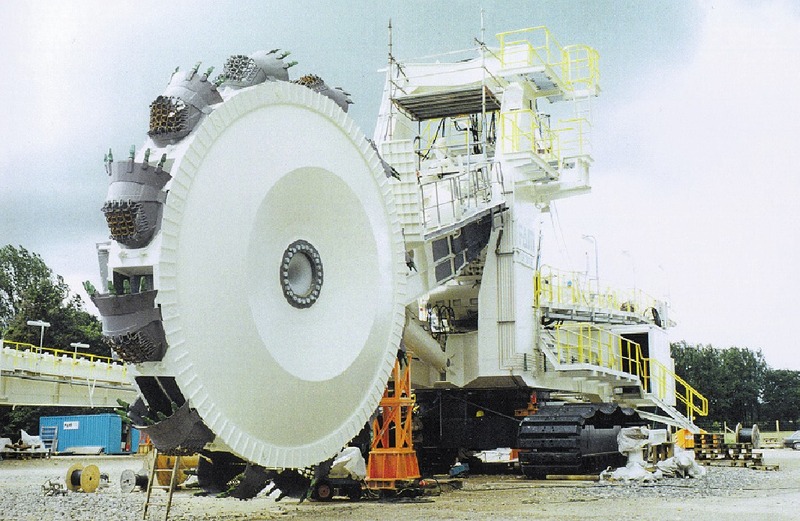 Quartz Sand Pit In 1998 two 100 HP model 800H Rulmeca Motorized Pulleys were installed on FAM bucket wheel excavator at German sand surface mine. 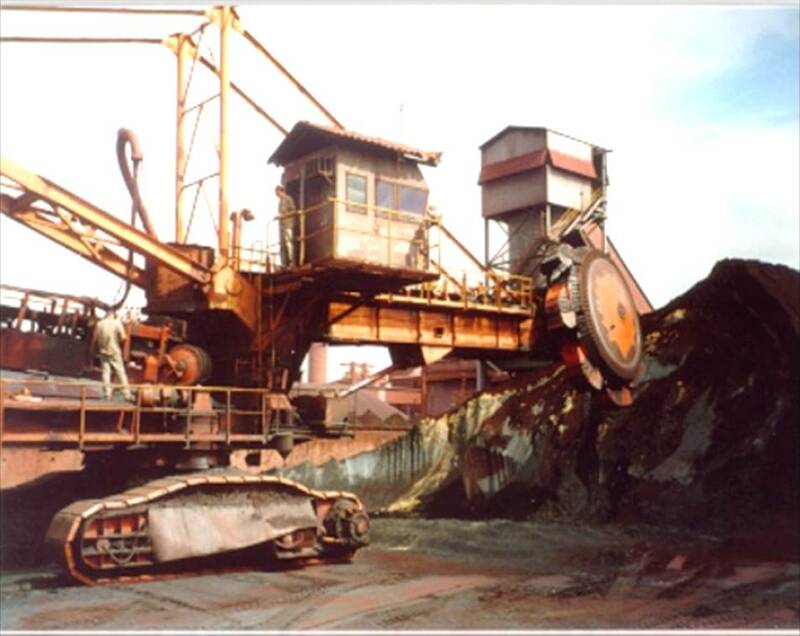 Coal Mine In 1994 a 75 HP model 800H Rulmeca Motorized Pulley was installed on this Krupp bucket wheel reclaimer at a Macedonian coal mine. 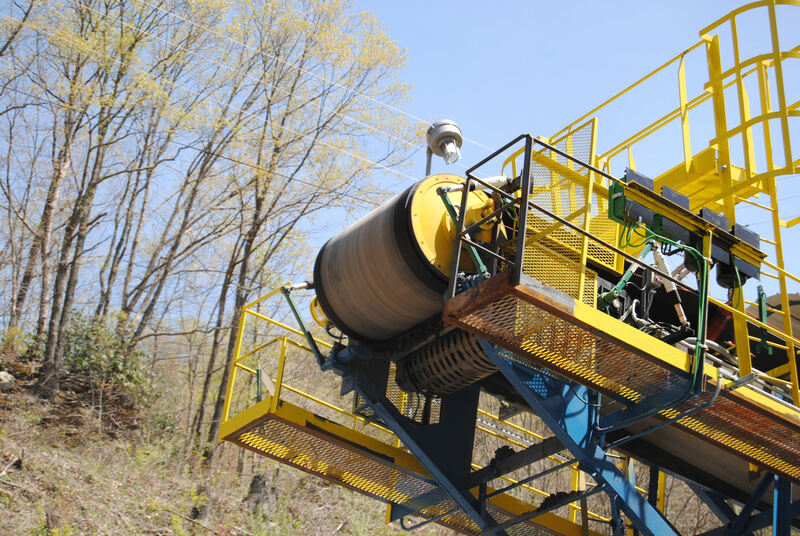 Coal Mine Model 800H 100 HP Rulmeca Motorized Pulley drives stacker conveyor near portal of underground coal mine in western Virginia. 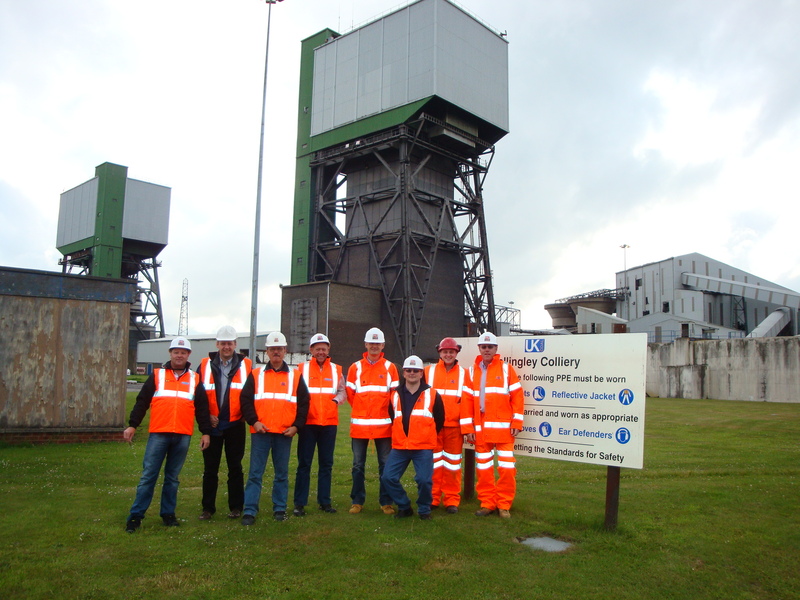 Coal Mine Rulmeca personnel visit UK coal mine to inspect numerous model 800H and 630H in service at major coal prep plant. 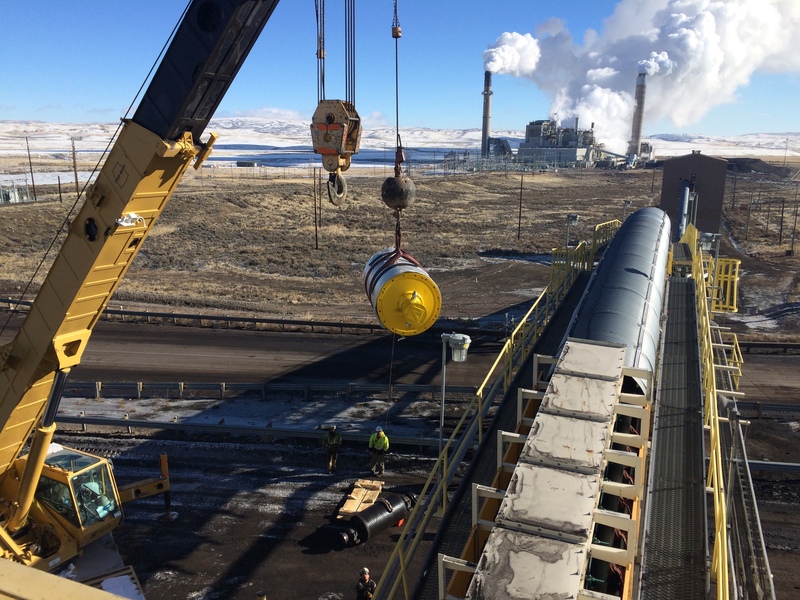 Coal Mine In 2015 a 180 HP model 800HD Rulmeca Motorized Pulley was installed to drive silo reclaim conveyor at Westmoreland Coal Mine in Wyoming. 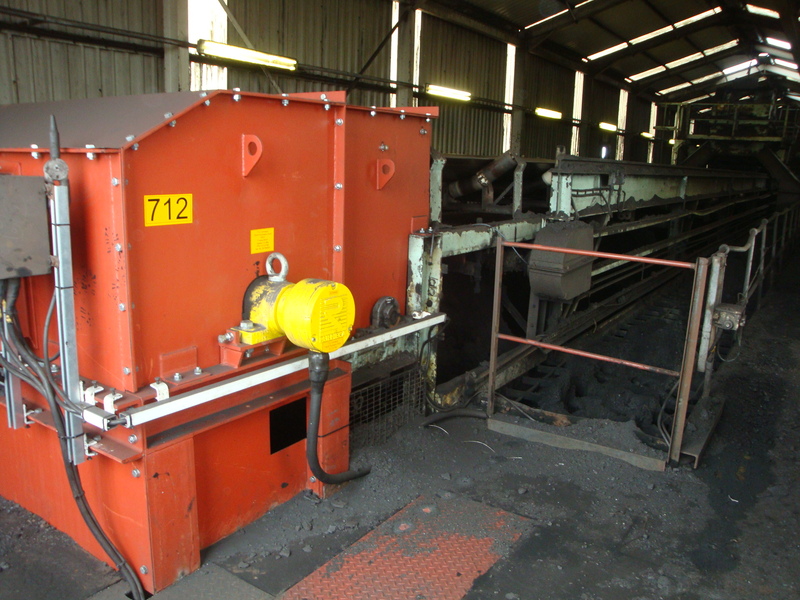 Coal Mine Model 800H at 150 HP drives coal storage bin feed conveyor at UK coal prep plant. 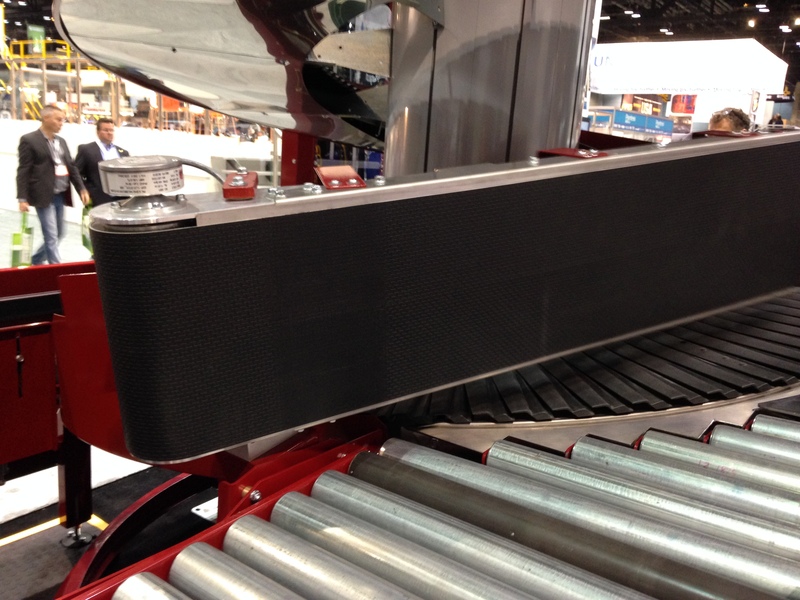 Compact size and low maintenance were key benefits. 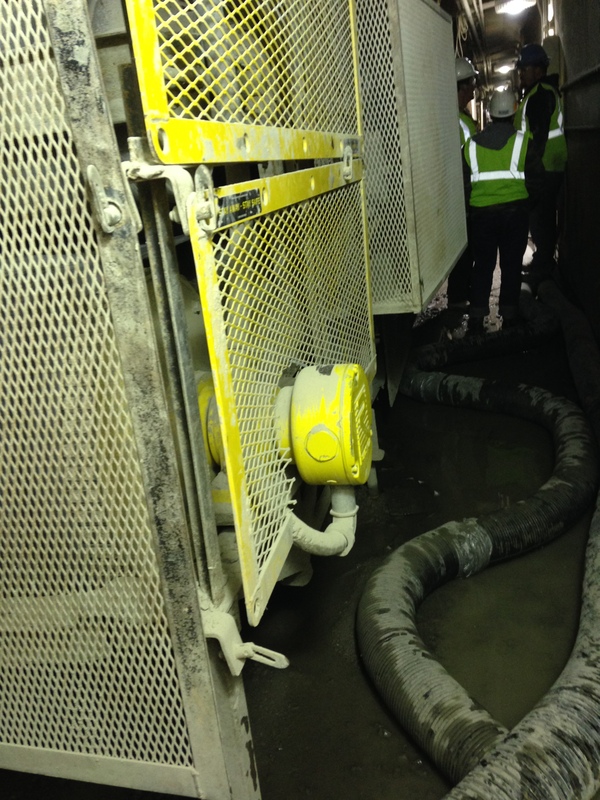 Coal Mine Two 75 HP model 630H Rulmeca Motorized Pulleys drive panel belt in US underground coal mine. 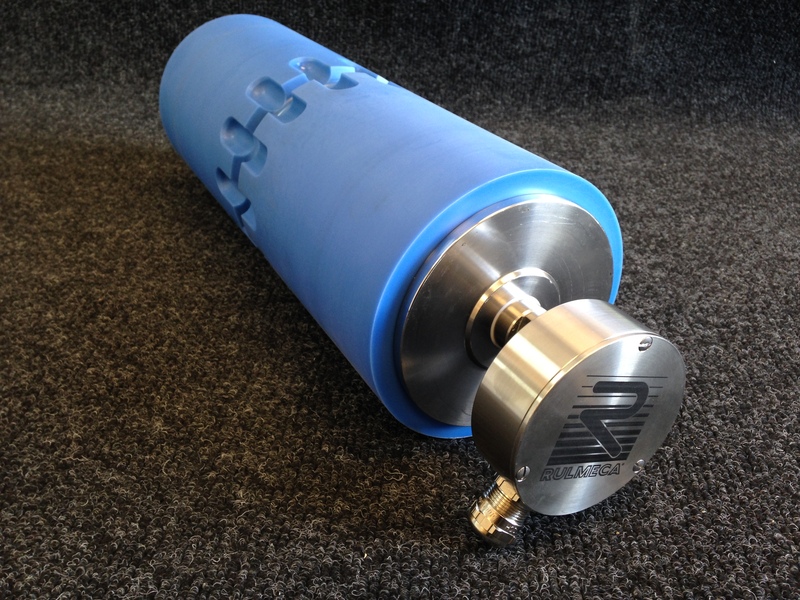 "Nested dual" arrangement decreases slack side tension requirements. 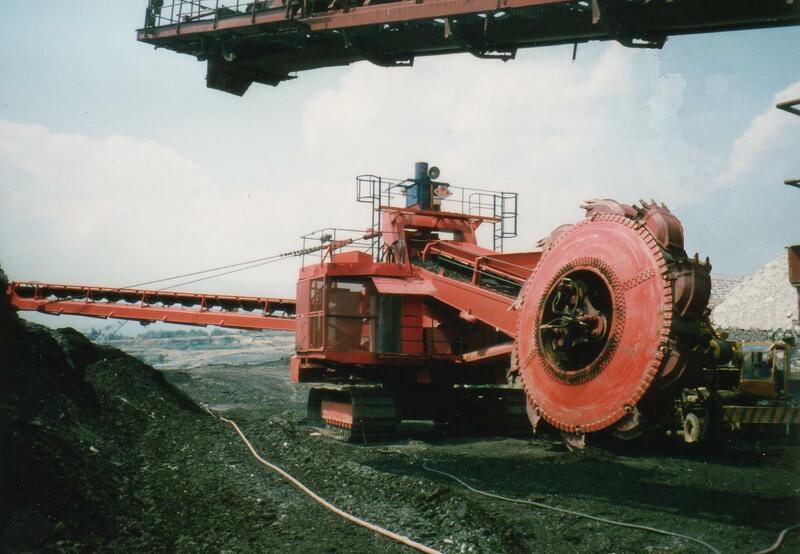 Coal Mine Compact size and light weight of this 180 HP model 800HD Rulmeca Motorized Pulley enabled operators to install it in US coal mine in one shift. 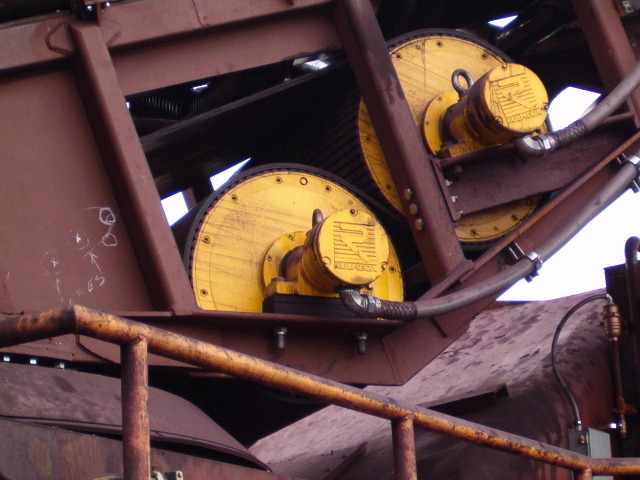 Salt Mine Exposed conveyor drive system in 2008 at US salt mine BEFORE conversion to 60 HP model 630H Rulmeca Motorized Pulley. 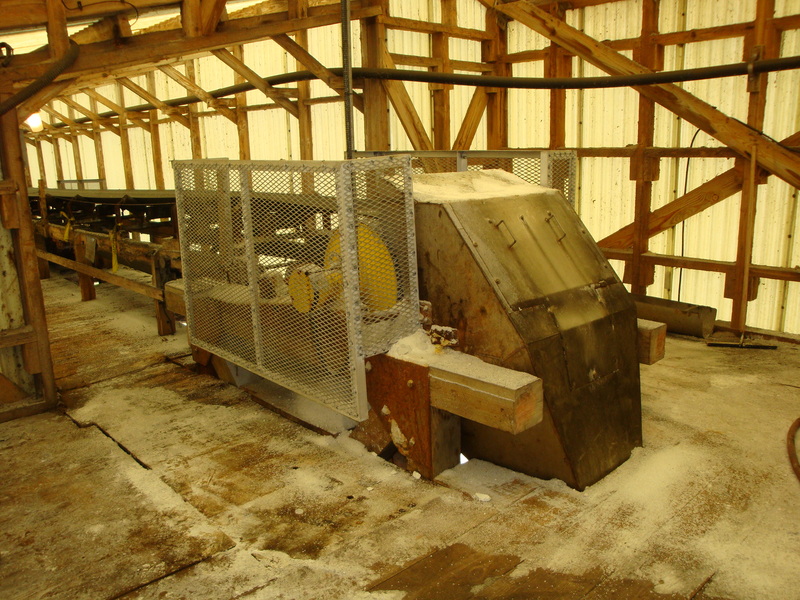 Salt Mine Conveyor drive system in 2008 at US salt mine AFTER conversion to 60 HP model 630H Rulmeca Motorized Pulley. 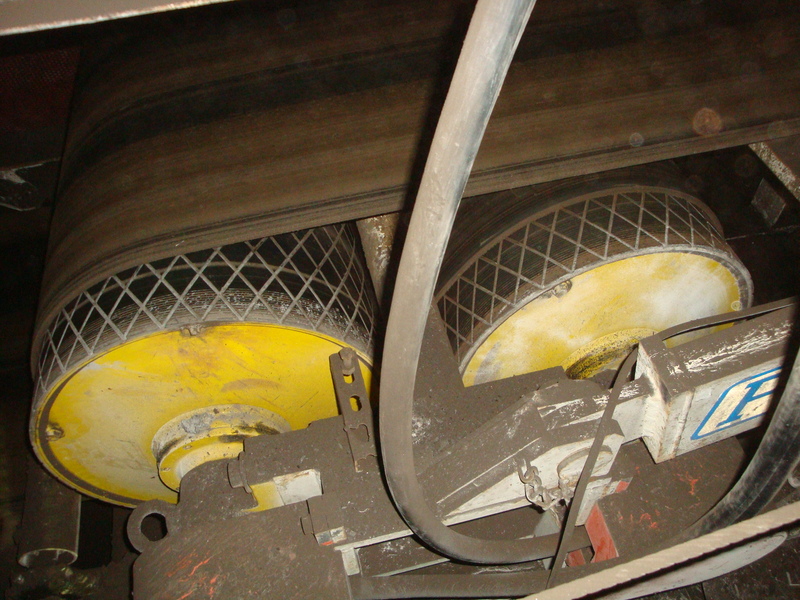 Salt Mine Conveyor drive system in 2009 at US salt mine AFTER conversion to 60 HP model 630H Rulmeca Motorized Pulley. 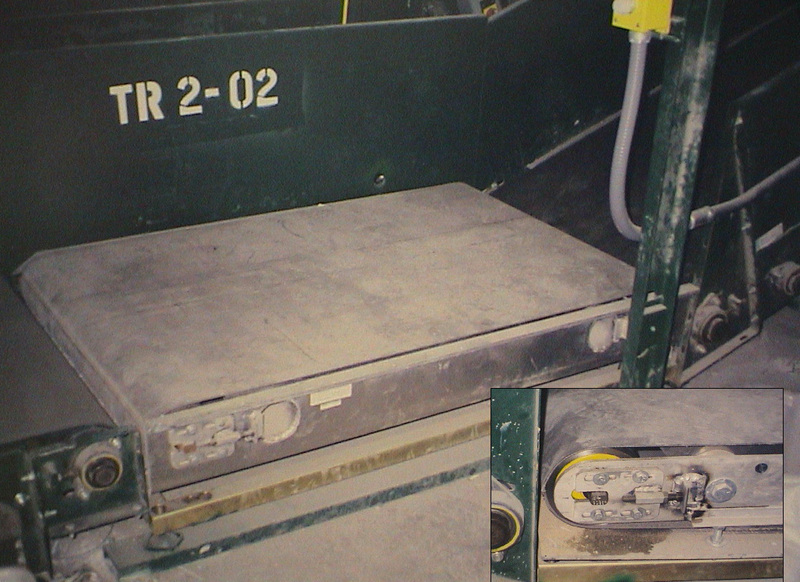 Salt Mine Rulmeca Motorized Pulley terminal box and mounting bracket at US salt mine. 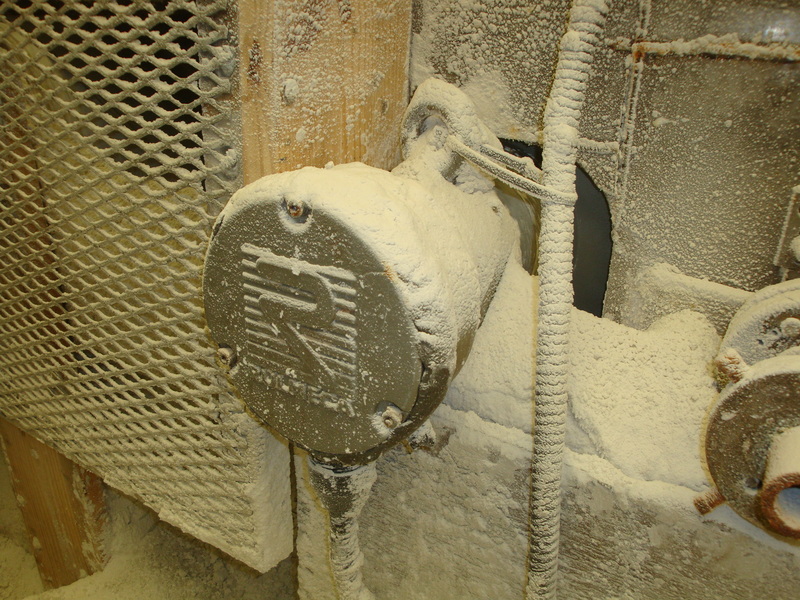 Hermetic seal protects internal components from wet salt. 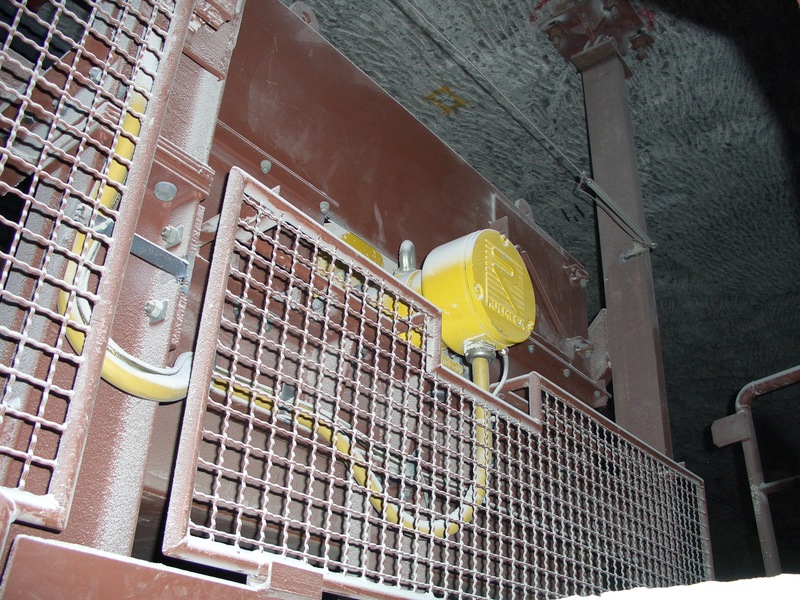 Salt Mine Rulmeca Motorized Pulley model 630H installed in German underground salt mine in 1990. 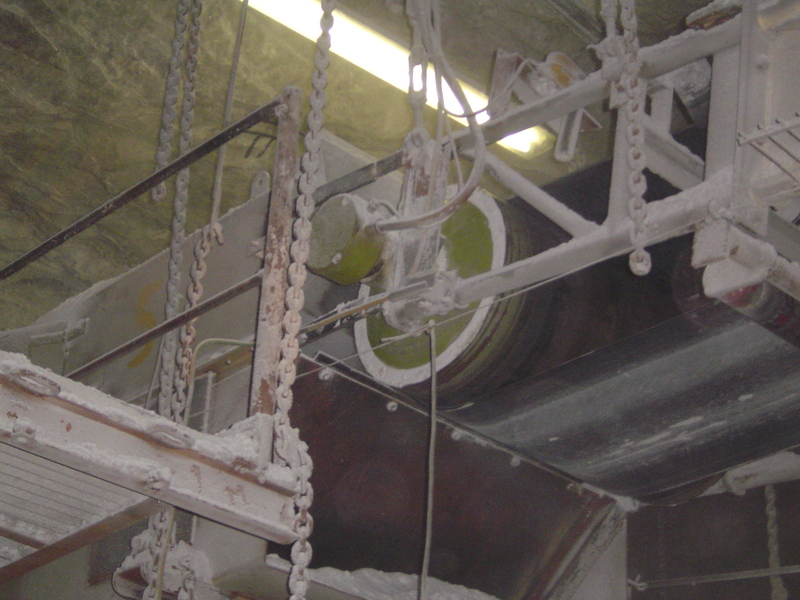 Salt Mine Rulmeca Motorized Pulley model 800H installed in German underground salt mine in 2005. 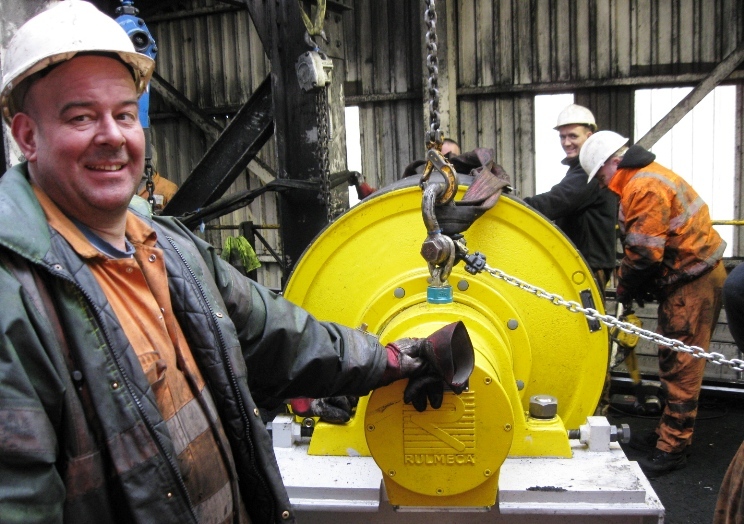 Uranium Mine In 2008 eight 75 HP model 630H Rulmeca Motorized Pulleys were installed at an Australian uranium mine. 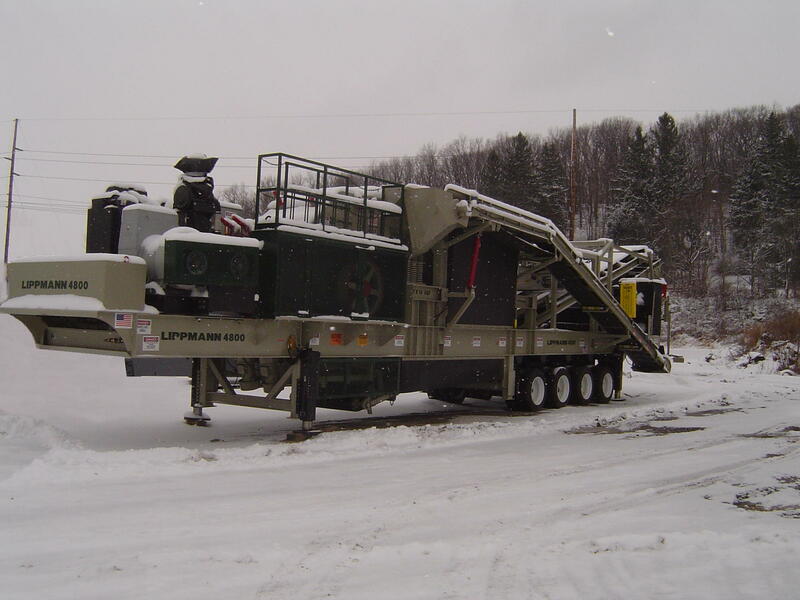 Mobile Plants Rulmeca has supplied model 320M Motorized Pulleys to the manufacturer of this mobile dry cyclone separator for more than 15 years. 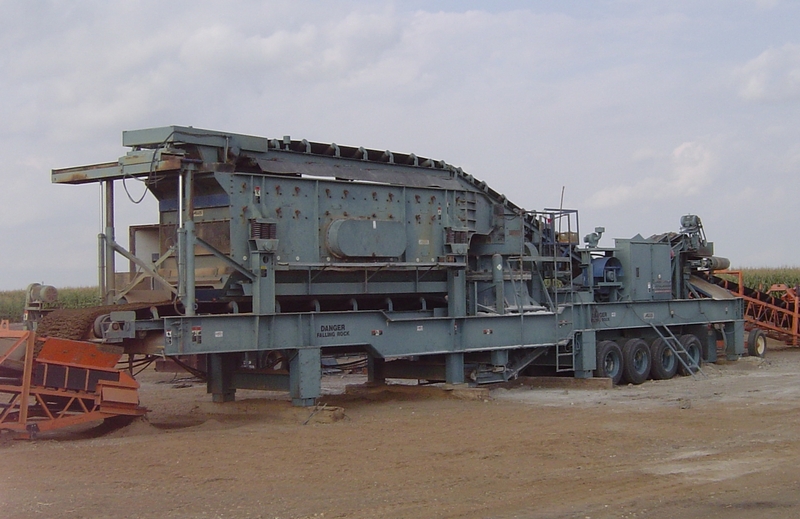 Mobile Plants Model 320M offers compact, efficient, low maintenance drive to this mobile plant discharge conveyor. 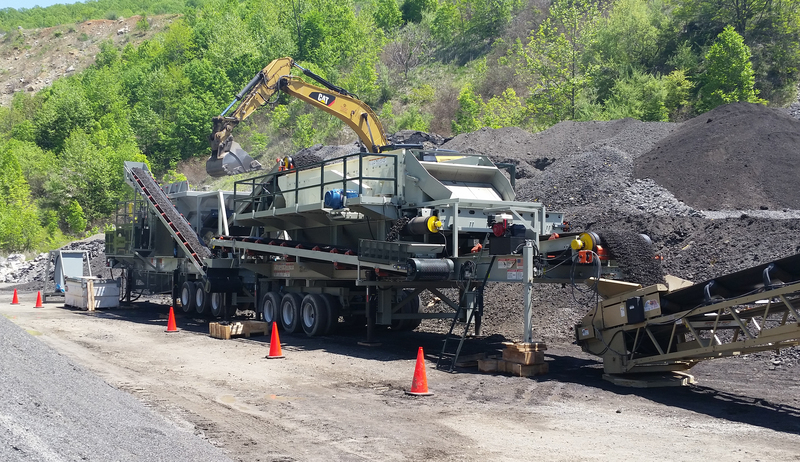 Mobile Plants Black Rock Crushing specifies Rulmeca Motorized Pulleys on all conveyor drives supplied on Lippmann Milwaukee mobile plants. 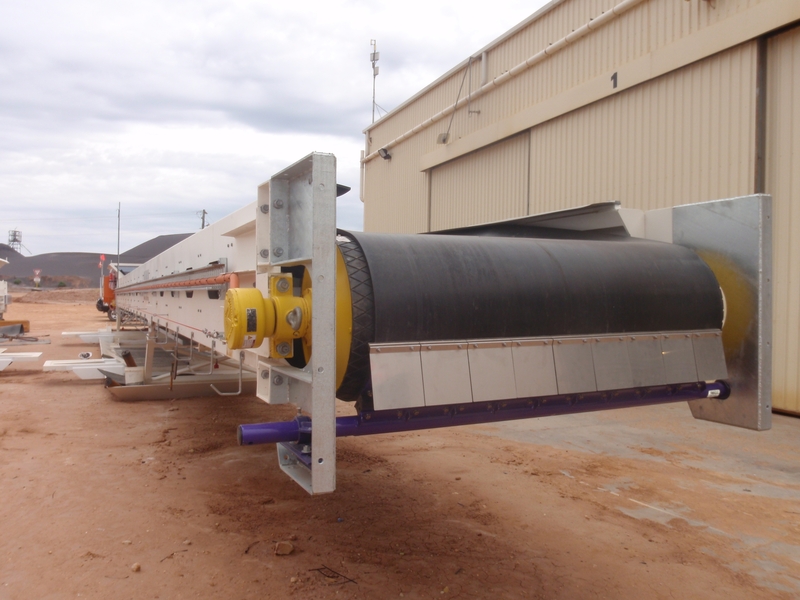 Mobile Plants End user modified screen feed conveyor to facilitate transport. 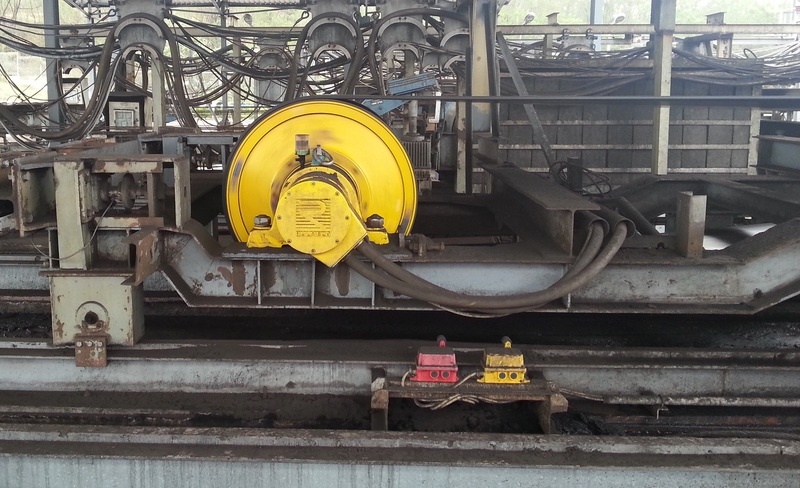 Two 15 HP model 400M on one conveyor were replaced by 3 model 400M on two conveyors to minimize spares. 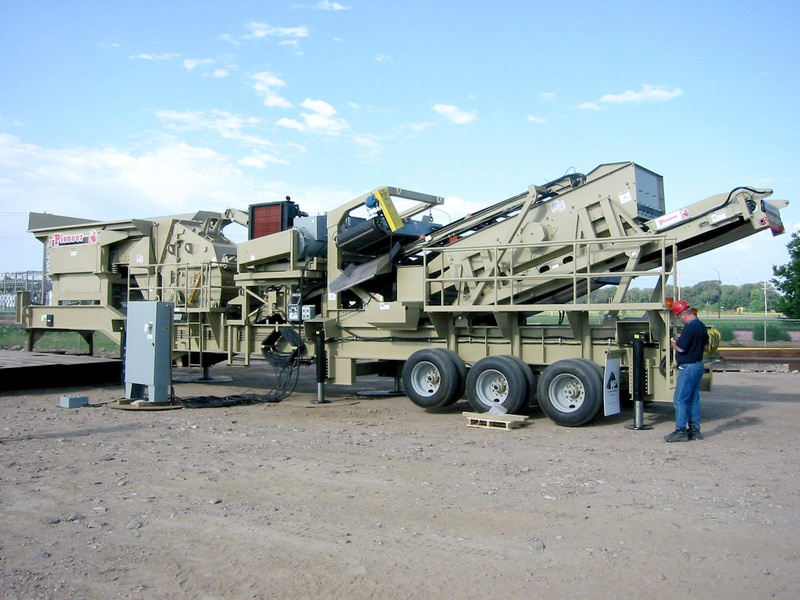 Mobile Plants This manufacturer uses Rulmeca Motorized Pulleys because the compact design is quick and easy to install, reducing build time. 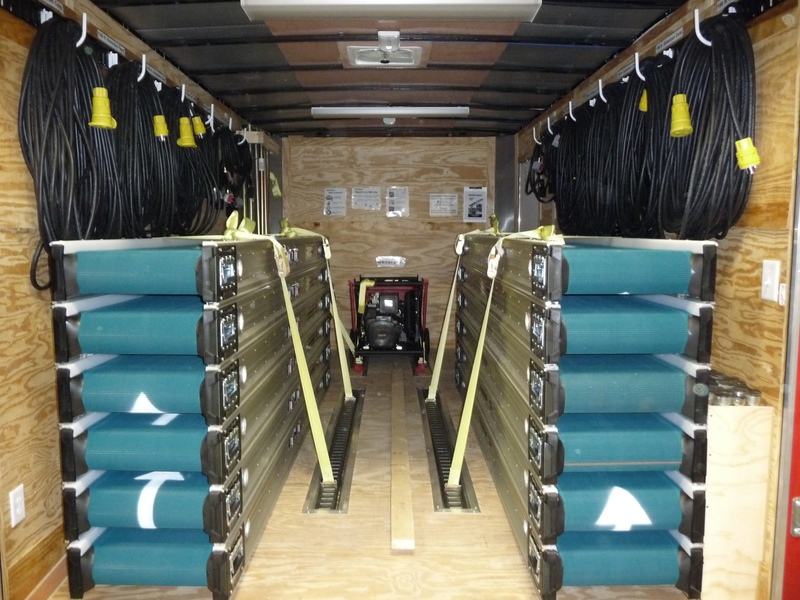 Mobile Plants Installing and maintaining mobile plant cross belts can be a "knuckle buster". 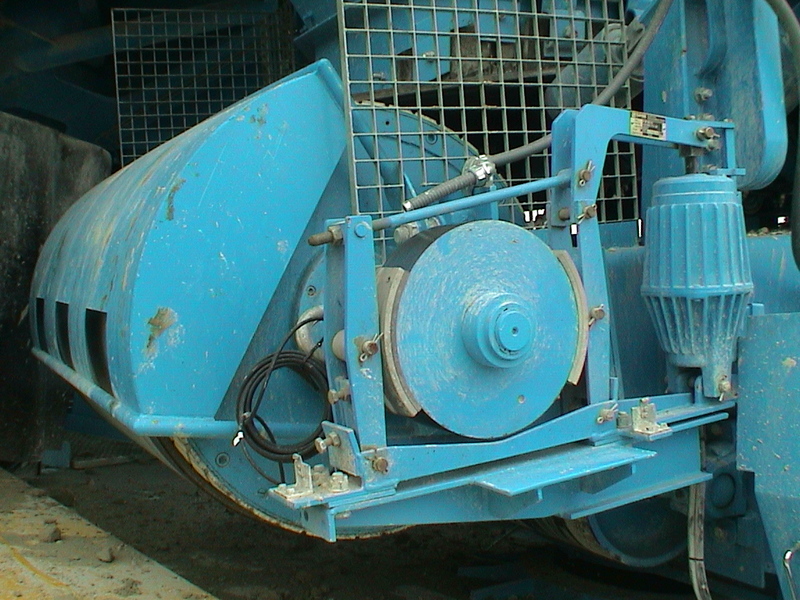 Compact model 220M and 320M Rulmeca Motorized Pulleys eliminate that problem. 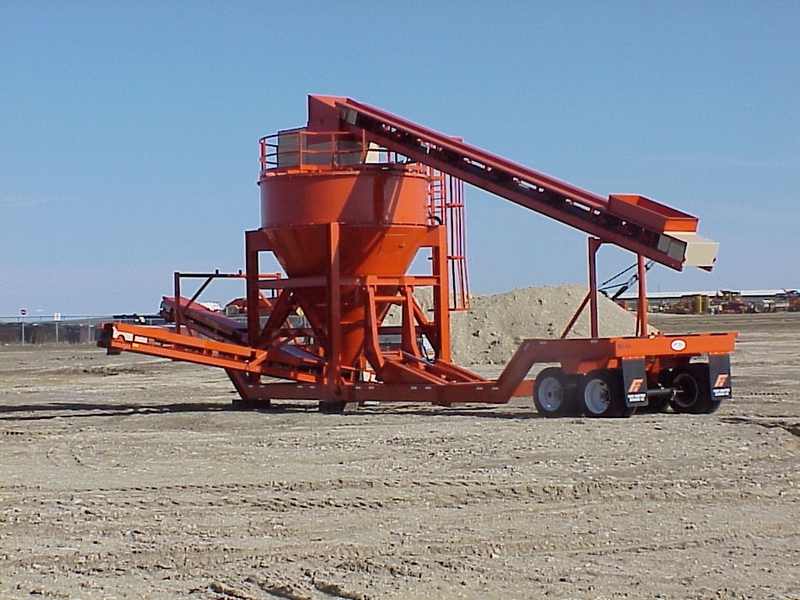 Mobile Plants Designed and built in 1995, this mobile plant features dual 15 HP model 400M on screen feed conveyor head and tail. 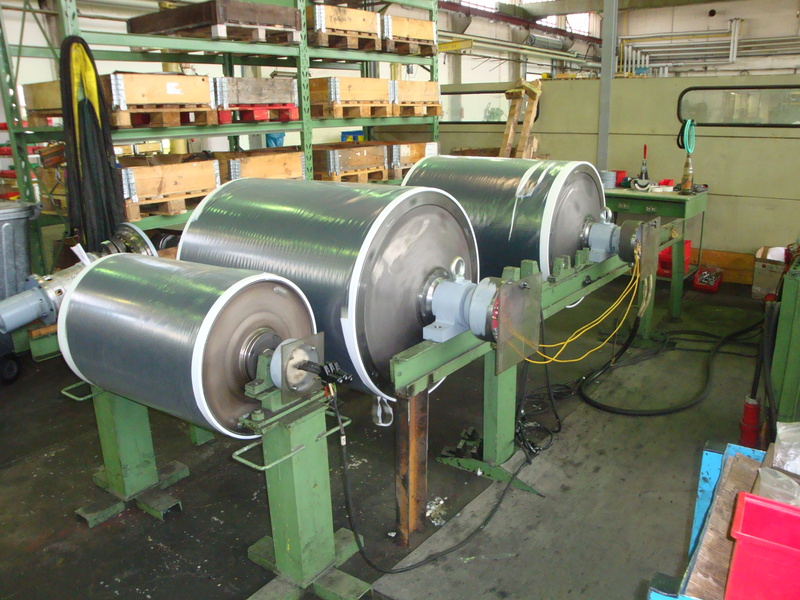 Mobile Plants Model 320M Rulmeca Motorized Pulleys are the ideal cross belt drive because all drive components are confined within the conveyor structure. 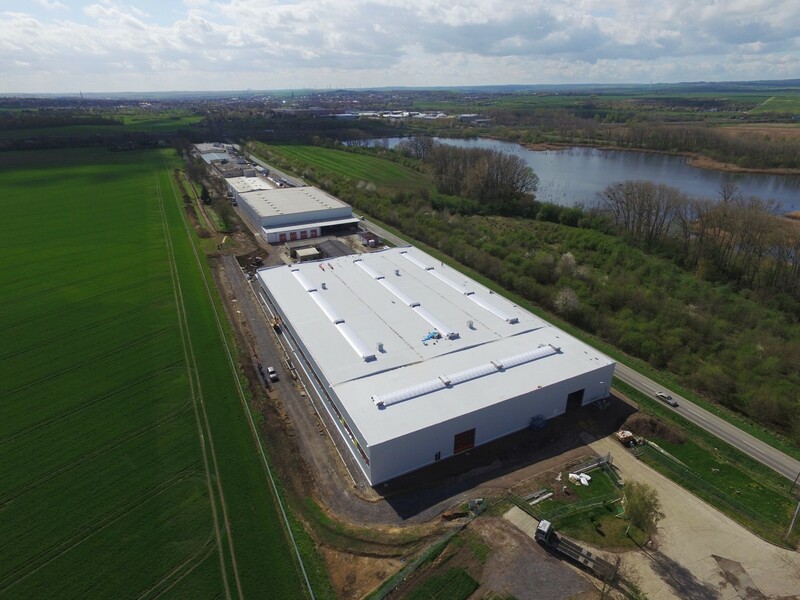 Mobile Plants Rulmeca multiport terminal box facilitiates installation of power and control cables on compact cross conveyor drives. 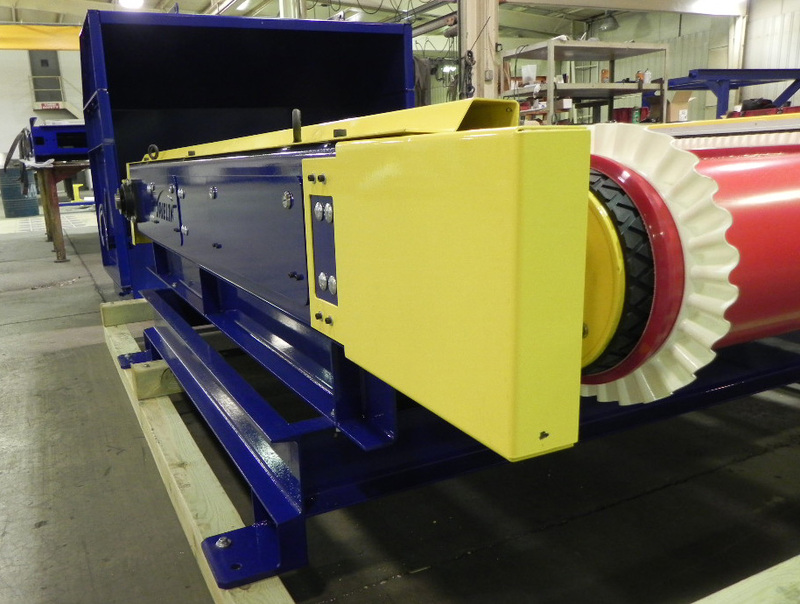 Mobile Plants Compact 15 HP model 400M Rulmeca Motorized Pulley streamlines the design of this screen feed drive while accommodating simple belt cleaner bracket. 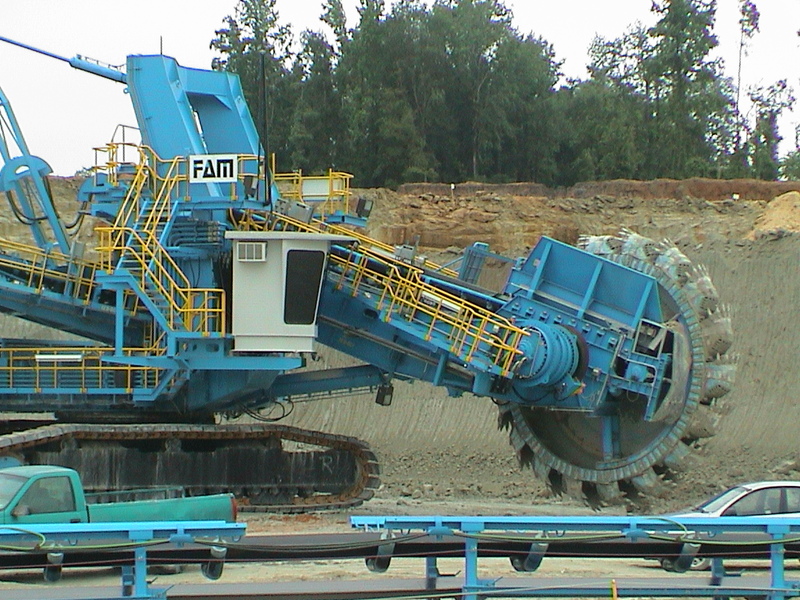 Mobile Plants Model 220M Rulmeca Motorized Pulley cross belt drive features steel bars instead of rubber lagging to optimize RAP handling. 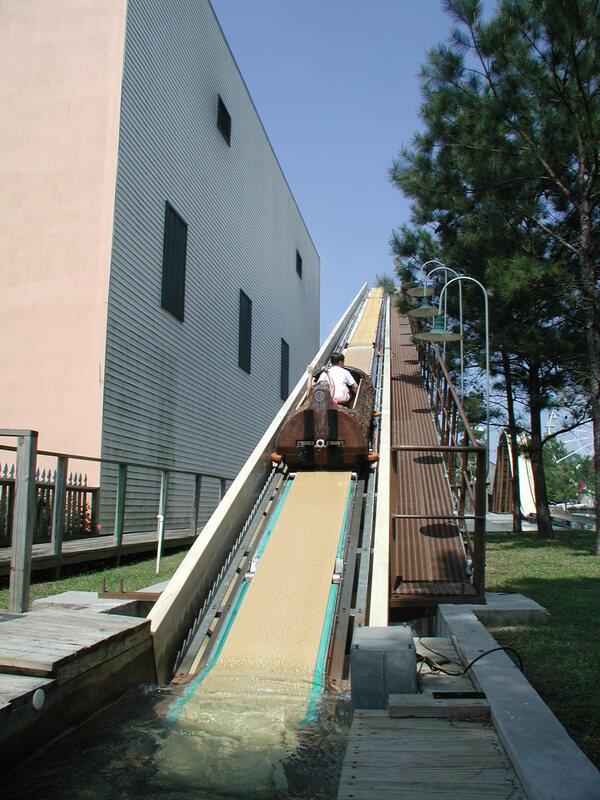 Amusement Park Model 320M Motorized Pulleys elevate log flume riders at Louisiana water park. 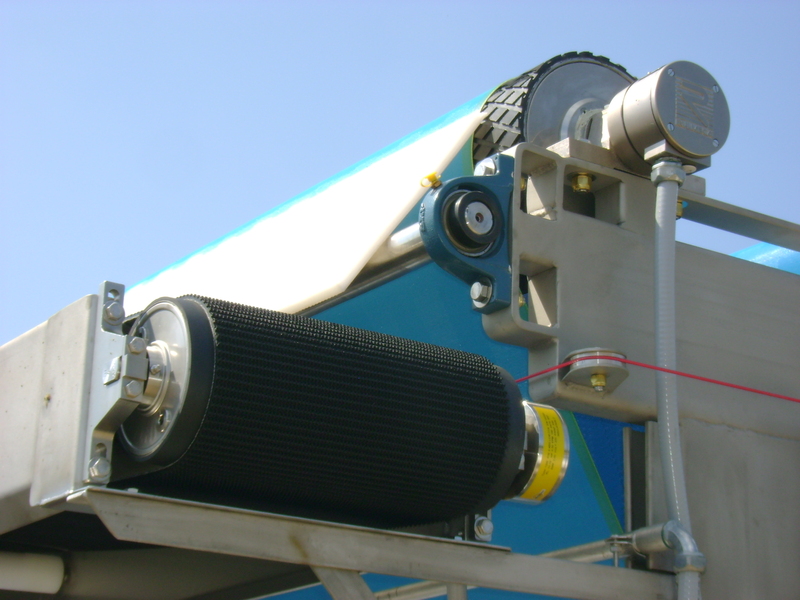 Air Cargo Handling Model 220M Motorized Pulley serves as speed up roller to move air cargo "belly boxes" from loading dock into trucks. 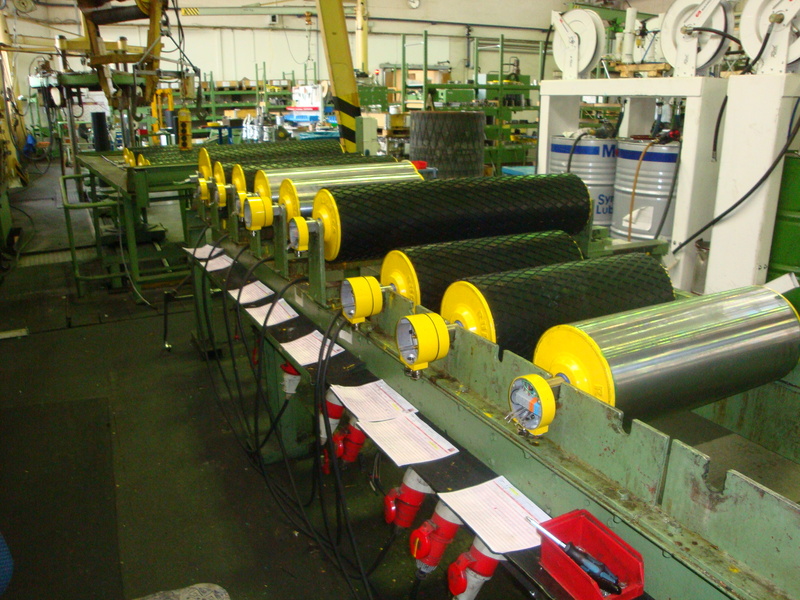 Tire Production "Green autombile tires" are transported on conveyor belts driven by 1 HP model 165LS Motorized Pulleys. 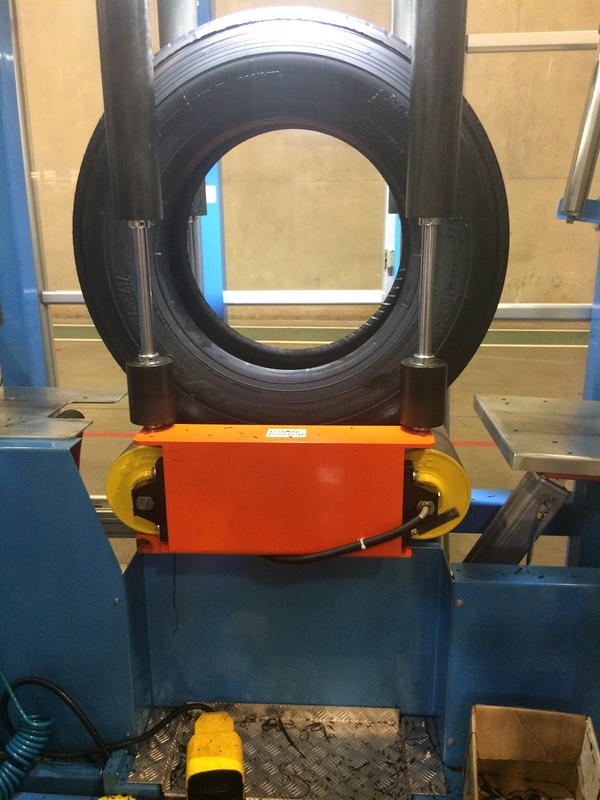 Tire Production Tire balancing machine is powered by 0.75 HP model 138LS Rulmeca Motorized Pulley and features matching UT138LS idler. 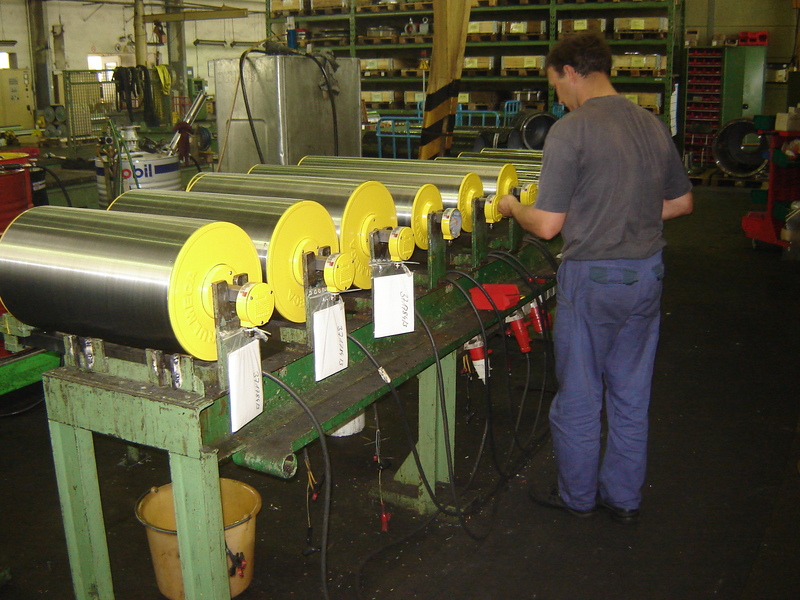 Wallboard Production Bundles of wallboard are diverted from table by 4 HP model 320M Rulmeca Motorized Pulley fitted with internal DC brake. 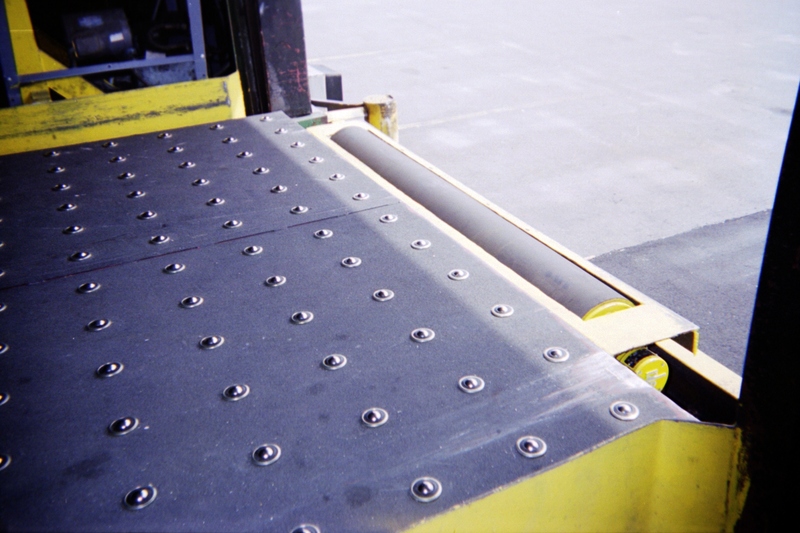 Cargo Weigh Scale Model 165LS Motorized Pulley drives weigh scale belt at major US metropolitan airport. 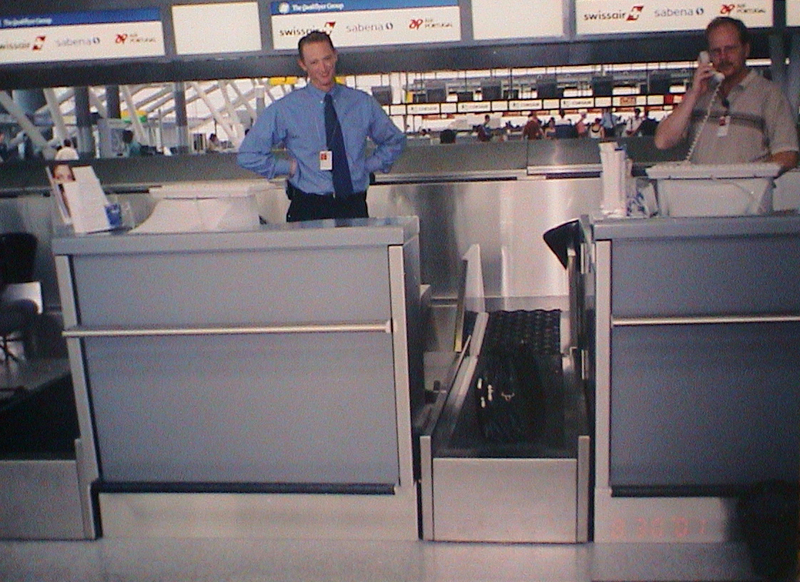 Luggage Check-in Model 138LS Motorized Pulley drives each luggage check-in belt at major US metropolitan airport. 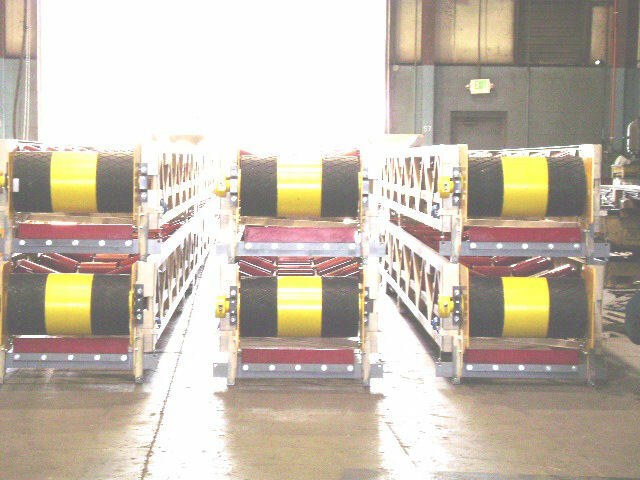 Mail Handling Rulmeca Motorized Pulley model 320M in nested drive arrangement moves bagged mail at major US mail P&DC. 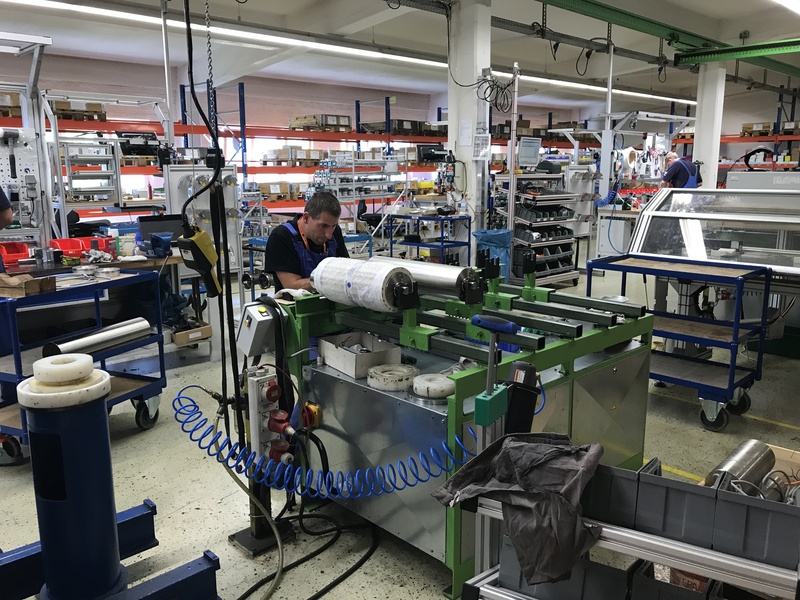 Package Handling "Vertical-mount" model 138LS Rulmeca Motorized Pulley drives belt on diverter gate for package handling. 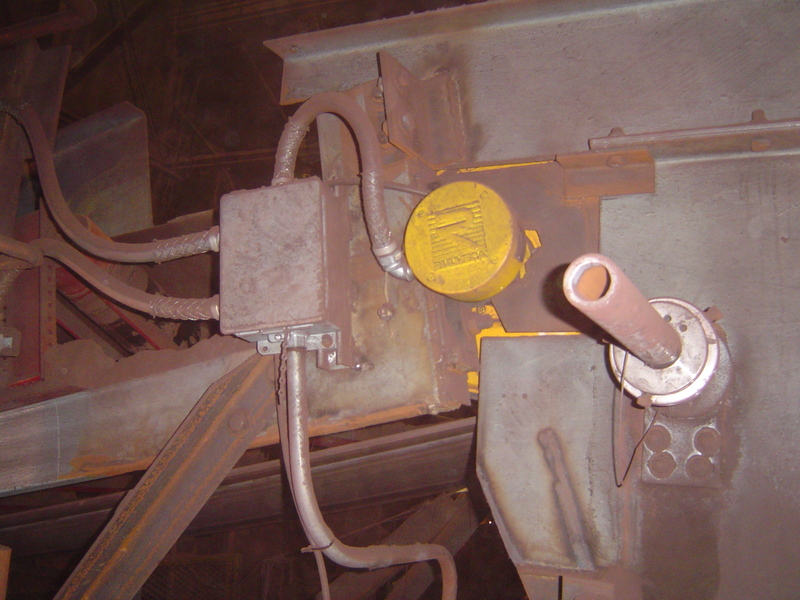 Rescue Equipment Standard model 138LS Rulmeca Motorized Pulleys drive personnel rescue carrier conveyors at a major US subway station. 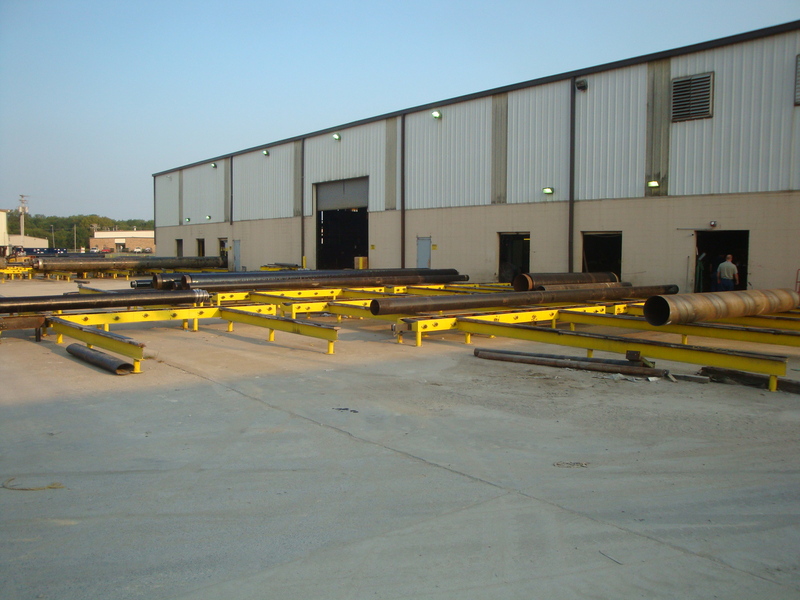 Pipe Production Model 220M Rulmeca Motorized Pulley with customized "hour glass" lagging drive heavy steel pipes at US pipe production facility. 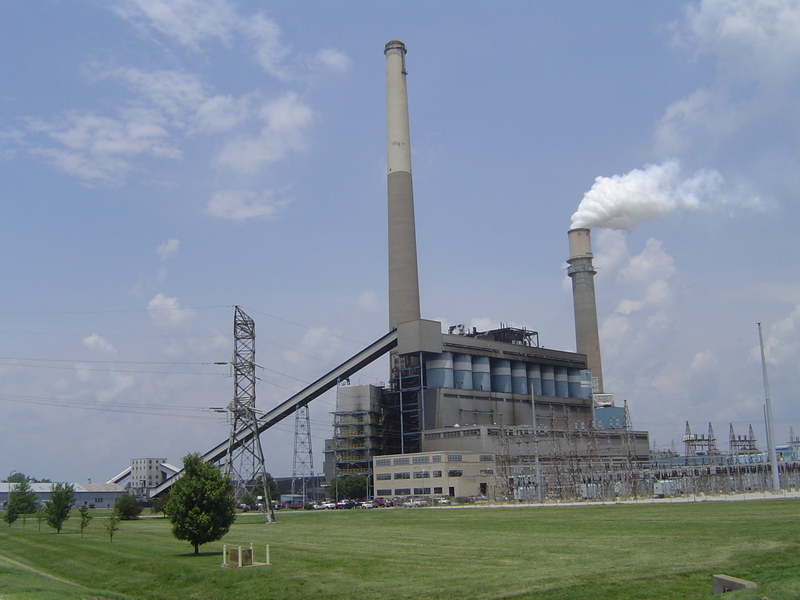 Electrical Power Generation Installed in 2006, this 100 HP model 800H Rulmeca Motorized Pulley transfers coal at a Kentucky power plant. 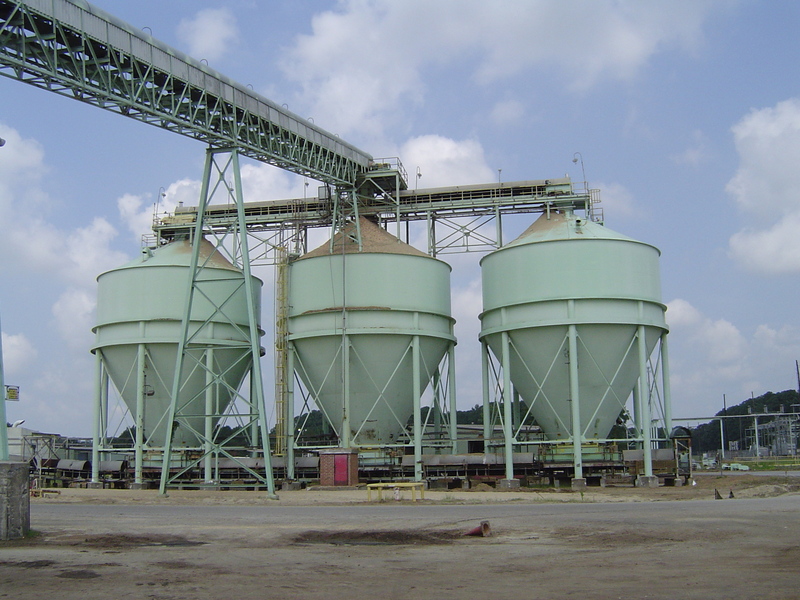 Electrical Power Generation Conveyors for coal and TDF (tire derived fuel) are powered by Rulmeca Motorized Pulleys at this US power plant. 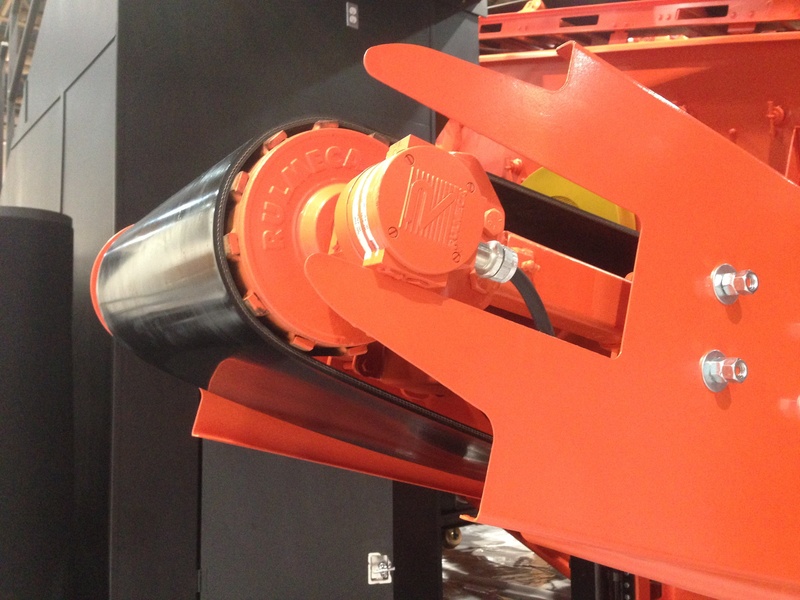 Electrical Power Generation One of two 270 HP model 1000H Rulmeca Motorized Pulleys driving 1,500 ft long conveyor at power plant in Thailand. 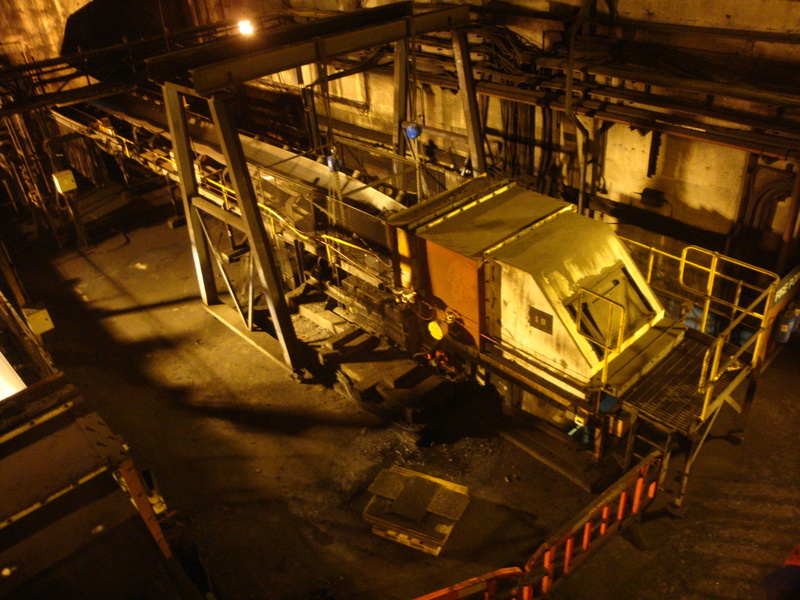 Electrical Power Generation Note huge obsolete exposed conveyor drive base replaced by compact 100 HP Model 800H at UK power plant. 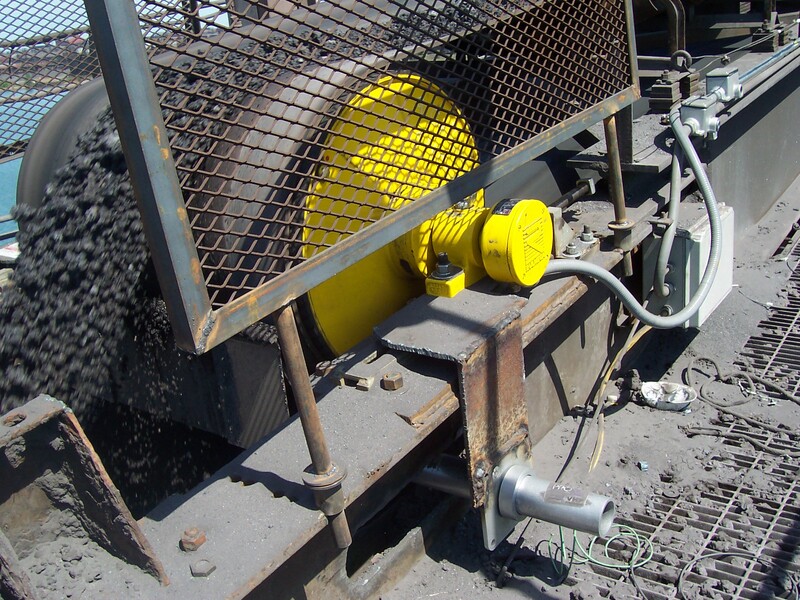 Electrical Power Generation Installed in 2010, this 20 HP model 500H Motorized Pulley drives fly ash conveyor at cogeneration facility in Pennsylvania. 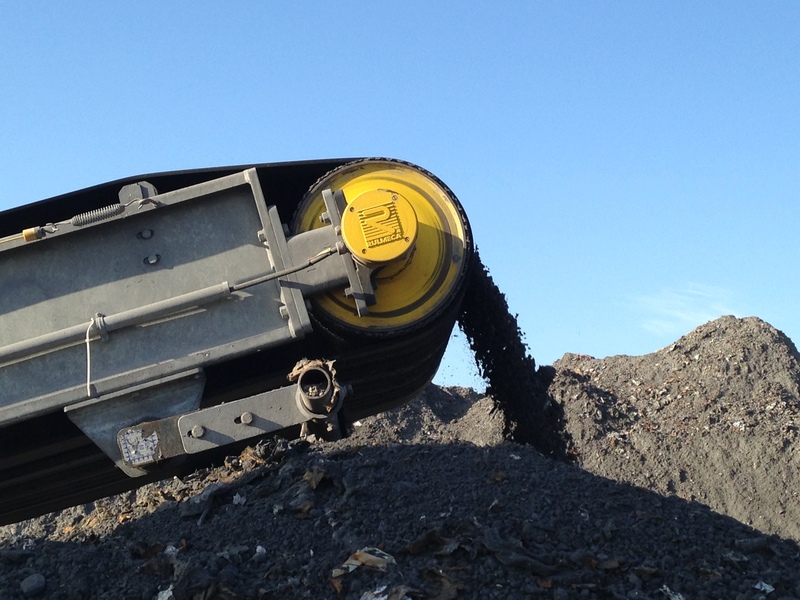 Electrical Power Generation One of two coal train dump conveyors powered by Rulmeca Motorized Pulley at 2,000 MW power plant in East Midlands, UK. 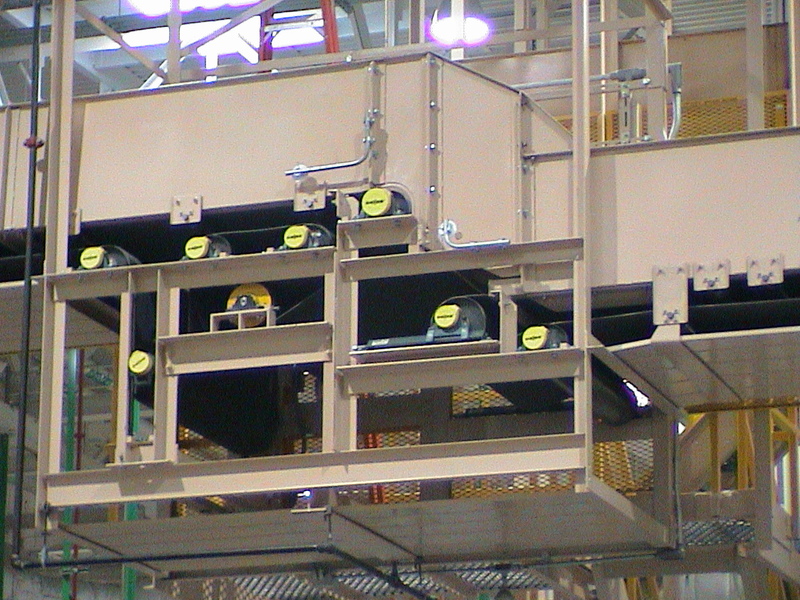 Electrical Power Generation Model 400M Motorized Pulley drives "bottom fines" conveyor at metal reclamation plant at Florida RDF facility. 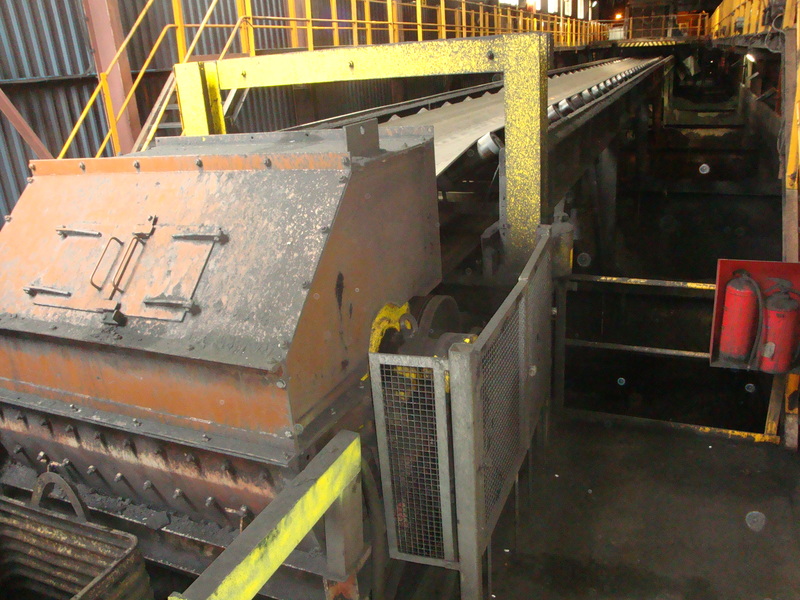 Bottom Ash Handling For more than three years, this 15 HP model 400M has powered bottom ash underscreen conveyor at Florida RDF facility. 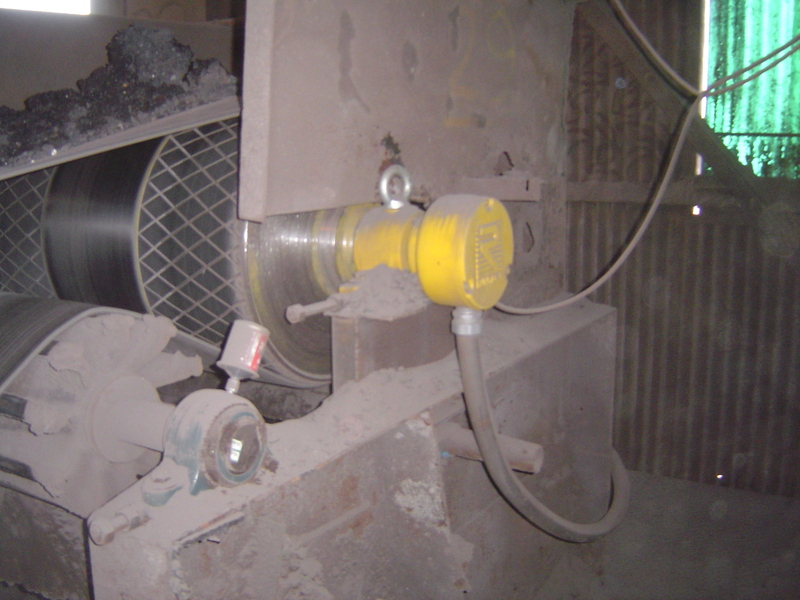 Metal Recycling Eddy current separator uses model 220M Rulmeca Motorized Pulley, in tail-position, to drive metal pieces past the rotor. 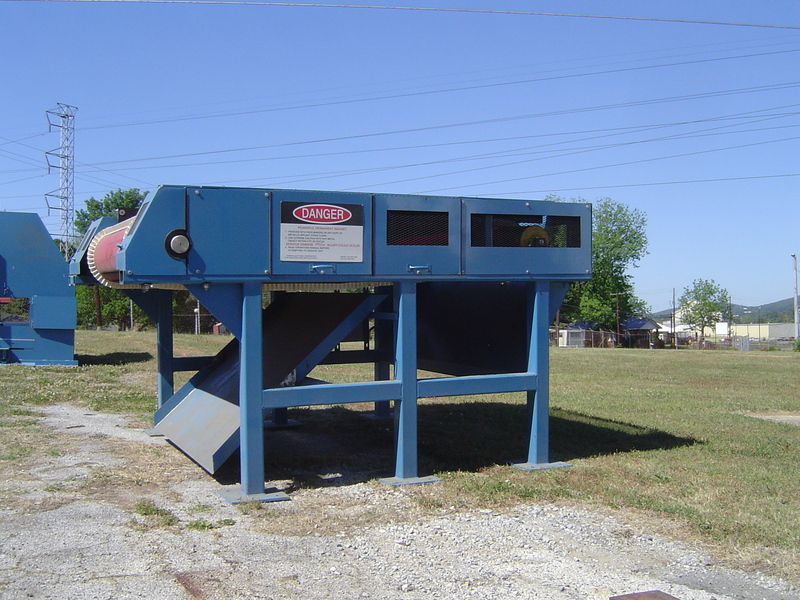 Metal Recycling With belt widths up to 84 inches, this eddy current separator uses a Rulmeca Motorized Pulley to drive metal pieces past the rotor. 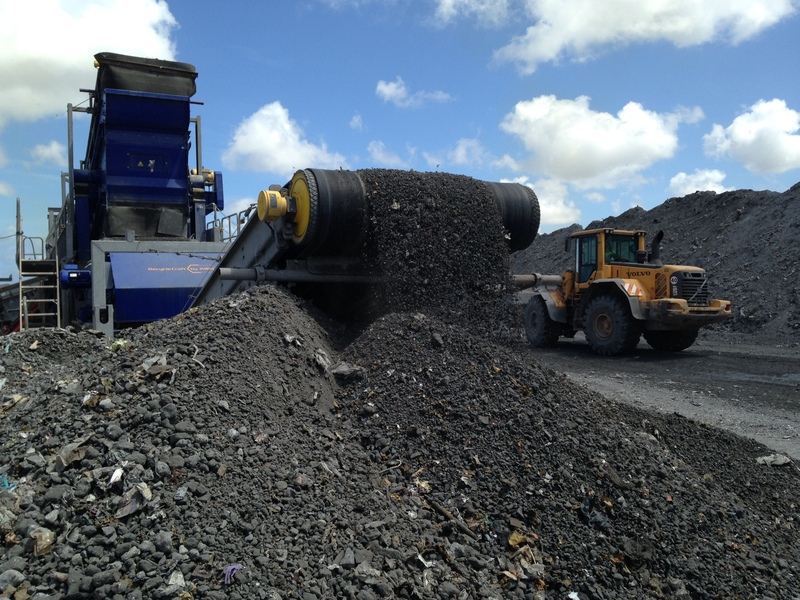 Metal Recycling With seven Rulmeca Motorized Pulleys driving belts, this system reclaims valuable metals from RDF plant bottom ash. 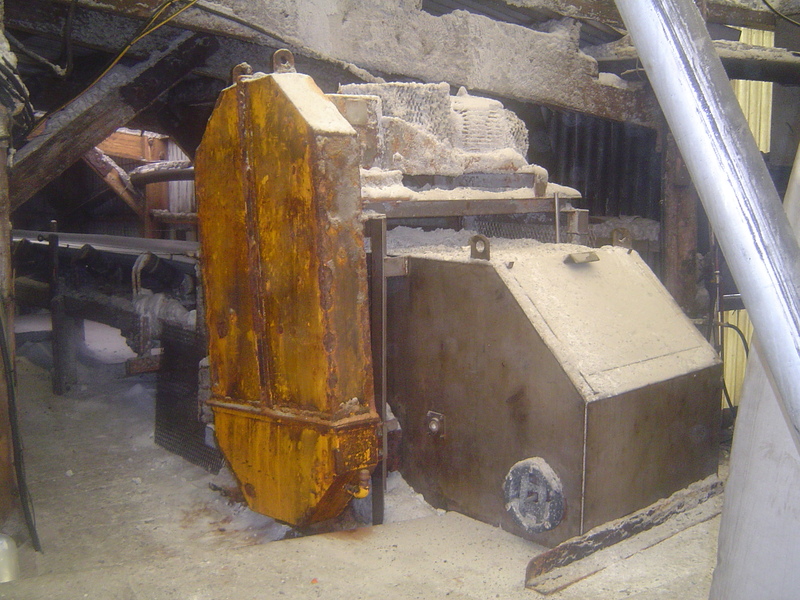 Metal Recycling Three eddy current separators enable this machine to reclaim three classifications of valuable metals from RDF plant bottom ash. 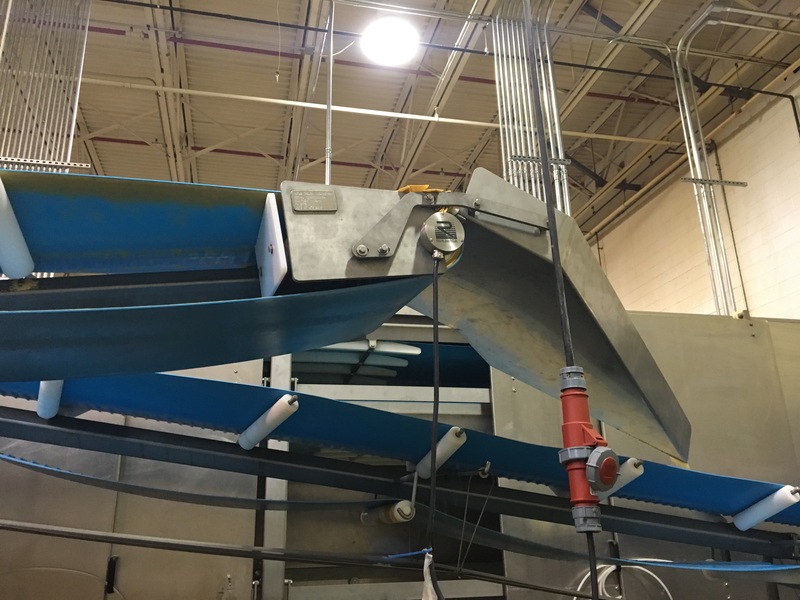 Metal Recycling Internally powered Rulmeca Motorized Pulley eliminates pinch points on this eddy current separator cross conveyor. 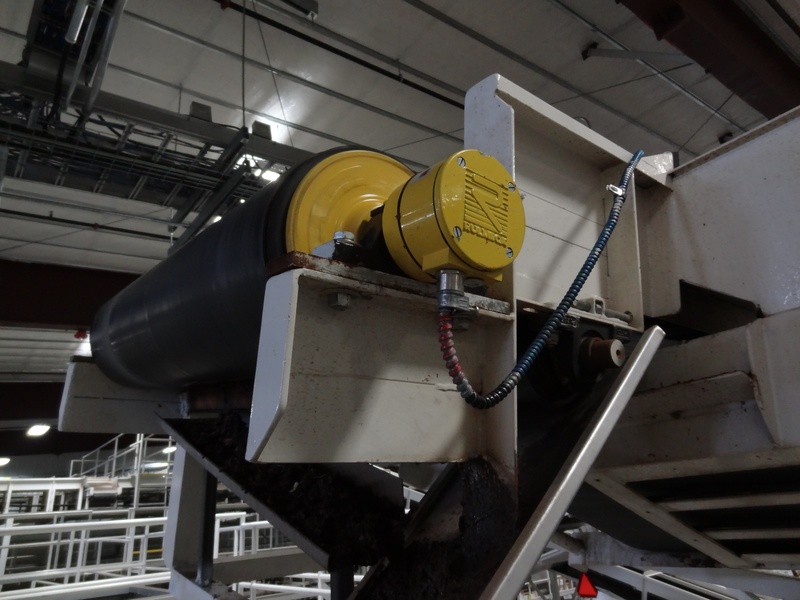 Organic Waste Recycling Trommel feed conveyor is powered by model 320M Rulmeca Motorized Pulley at this California organic waste facility. 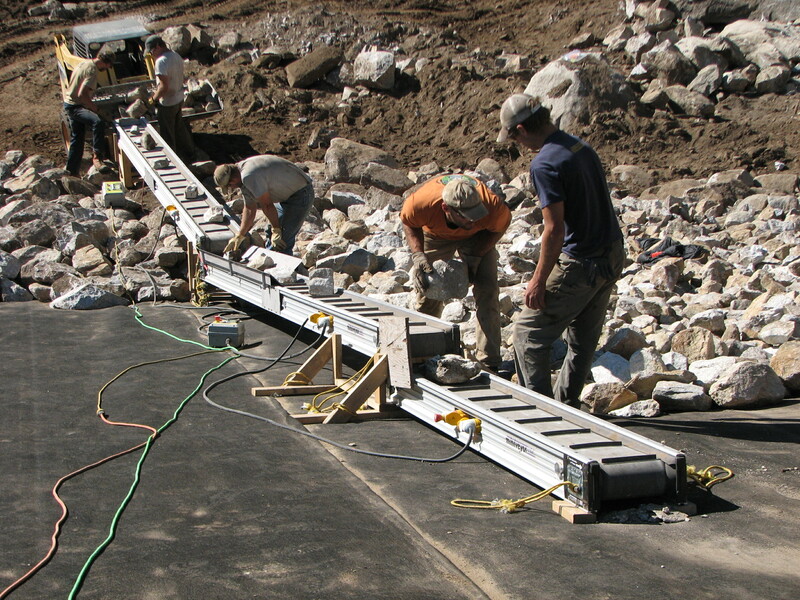 Rock Handling Retention pond membrane is protected by rocks, elevated by Miniveyors powered by model 138LS Rulmeca Motorized Pulleys. 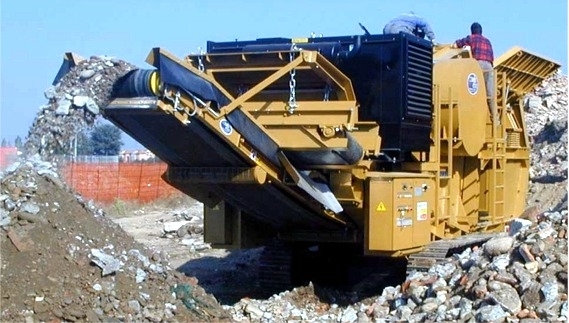 Soil Handling Small conveyors feed earth into wall structures. 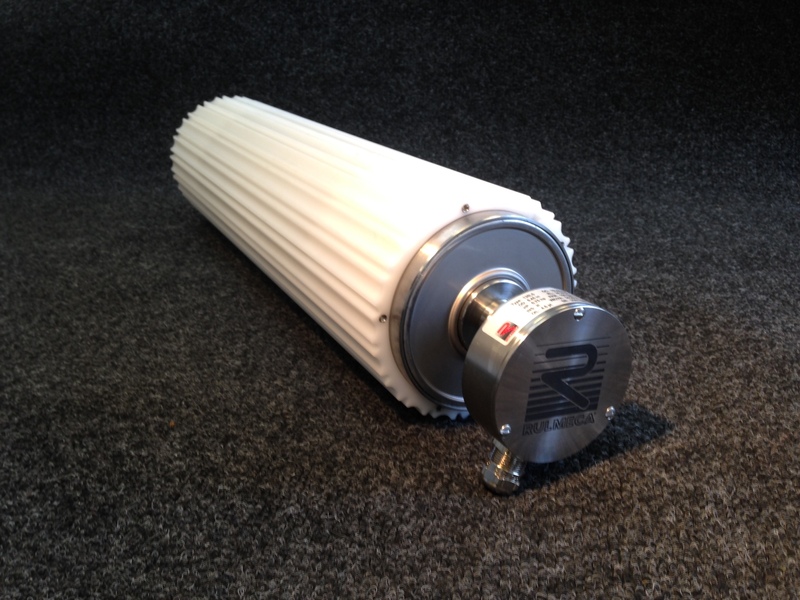 Model 138LS Rulmeca Motorized Pulleys make the system lighter and safer. 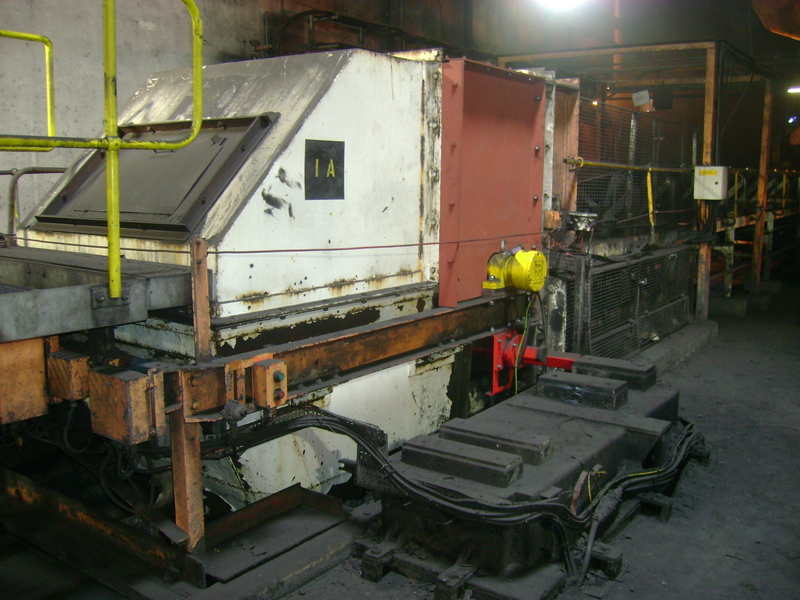 Steel Recycling Since 1995, this foundry has recycled scrap steel into rail car parts using Rulmeca Motorized Pulleys such as the model 400M. 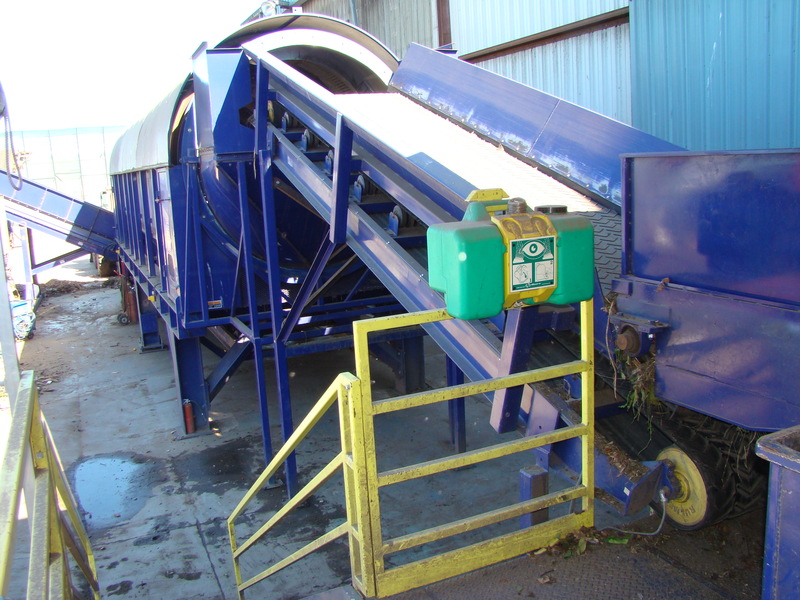 Trash Recycling This mobile European system uses various Rulmeca Motorized Pulleys to process trash using a 380v/3ph/60Hz power supply genset. 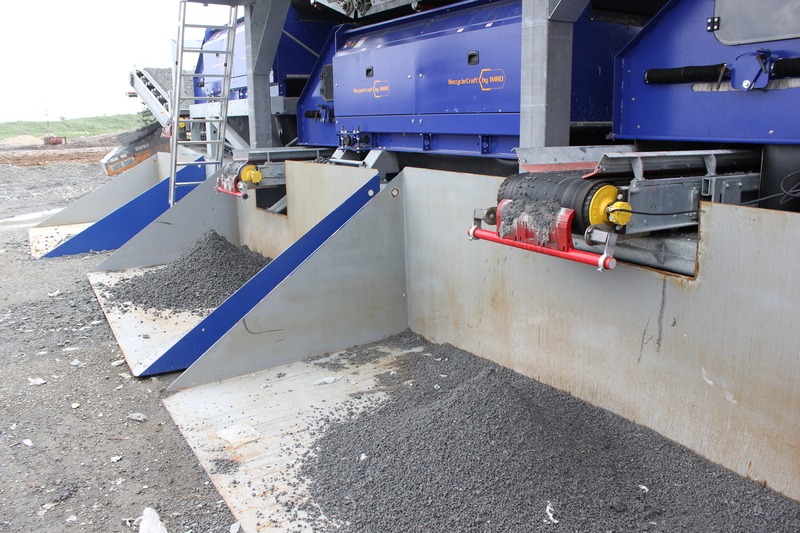 C&D Debris Thanks to its compactness, a 15 HP RMP was selected to drive the discharge conveyor on this concrete and RAP recycling plant. 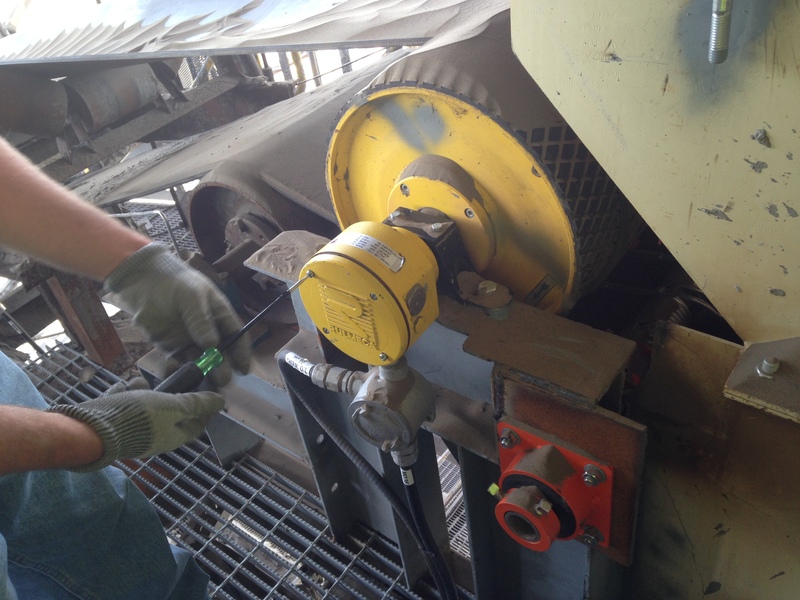 Motorized Pulley Testing Final testing of various model 320M and 220M (all unlagged). 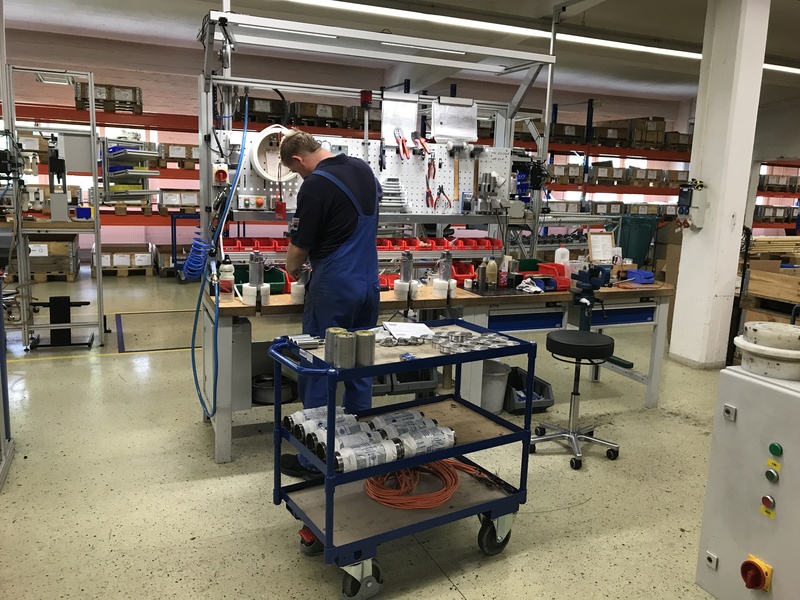 Motorized Pulley Assembly One model 400M and two model 630H during final testing. 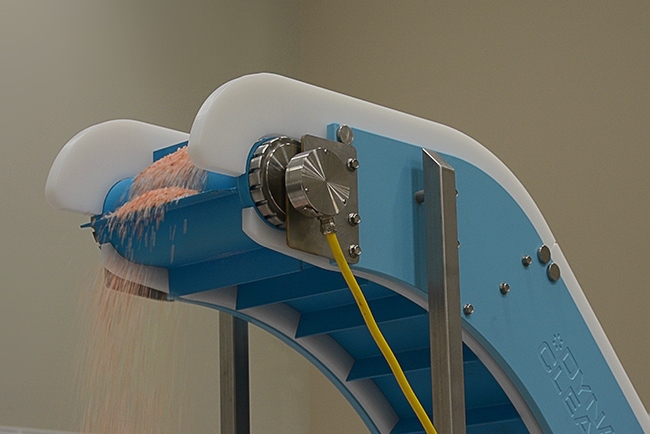 Motorized Pulley Testing Various model 220M (lagged and unlagged) during final testing. 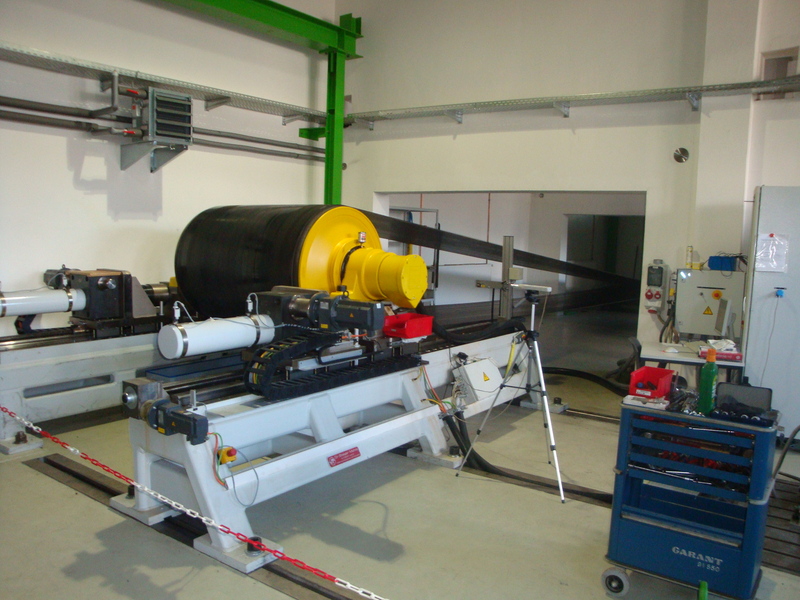 Motorized Pulley R&D Huge 40" diameter model 1000HD with 330 HP drivetrain tested under full load during in-house development in 2010. 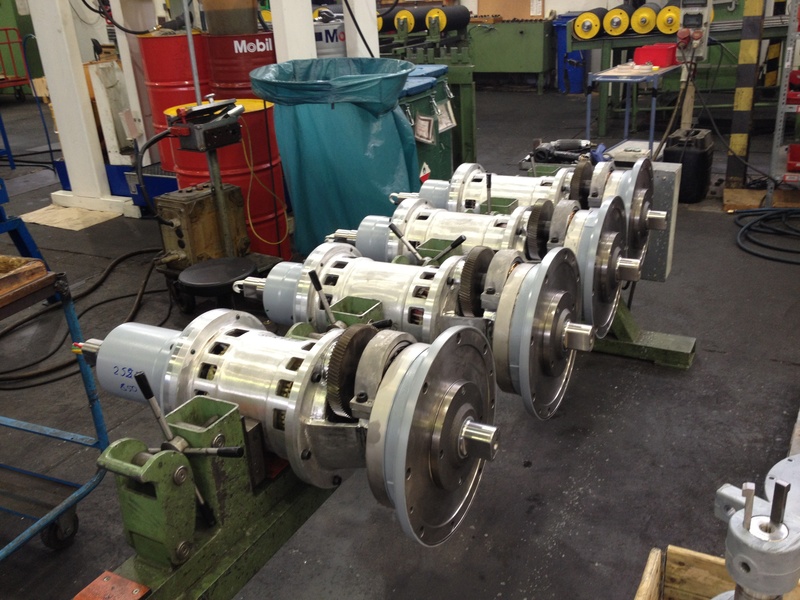 Motorized Pulley Assembly Model 320M drivetrains after installation on geared rims and end housings. 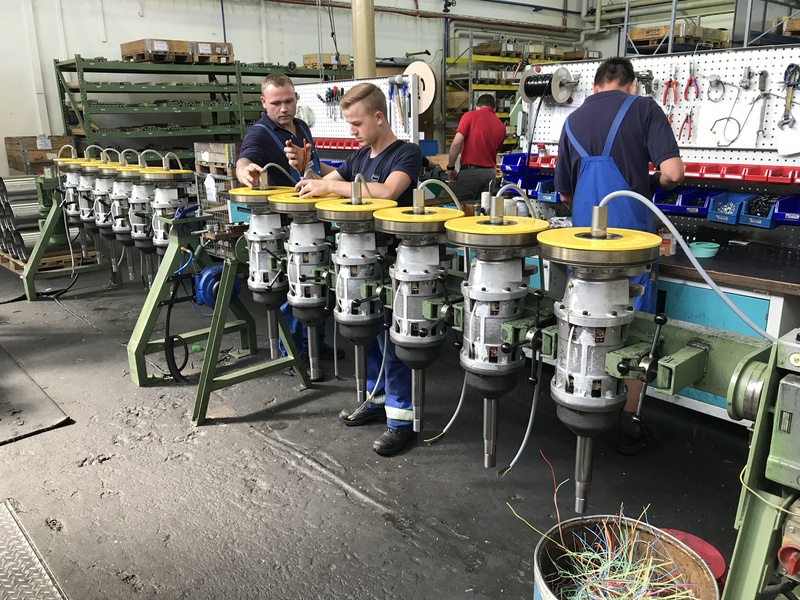 Motorized Pulley Assembly Batch of Model 400M drivetrains during initial run testing. 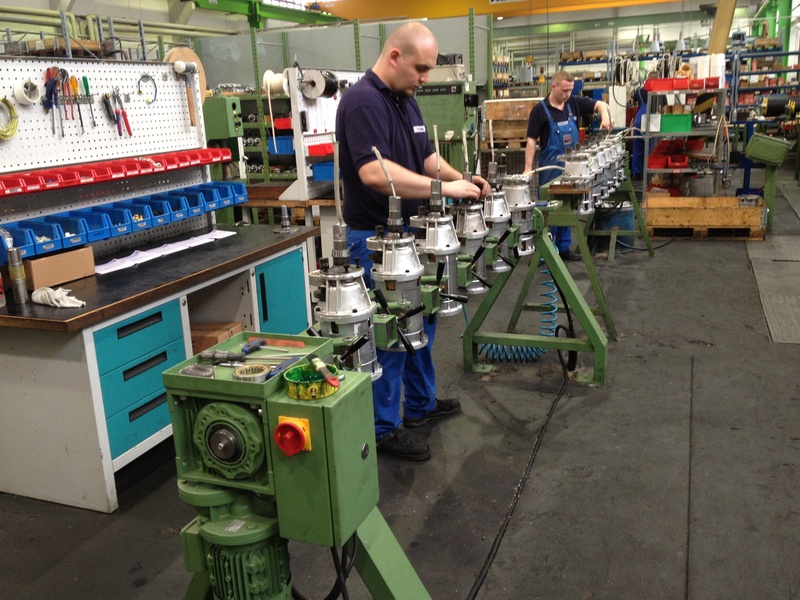 Motorized Pulley Assembly Assembly of a batch of drivetrains for model 113LS. 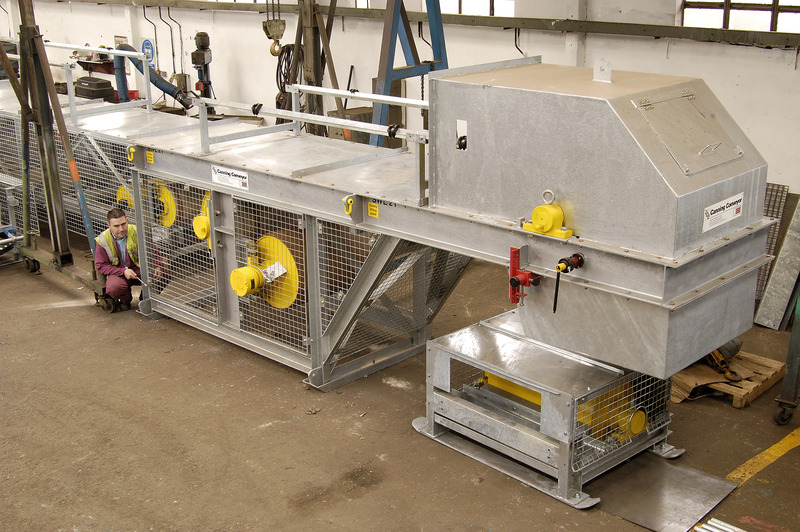 Motorized Pulley Testing Final testing of two Model 138LS (stainless steel option), one with profiled lagging and one with no lagging. 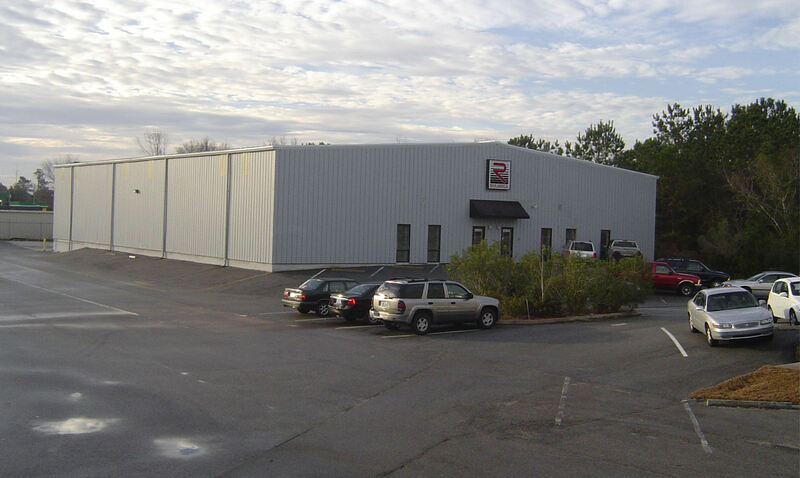 Rulmeca Corporation Wilmington, NC facility offers "Quick Ship" on most popular Motorized Pulleys models and service for complete product portfolio.